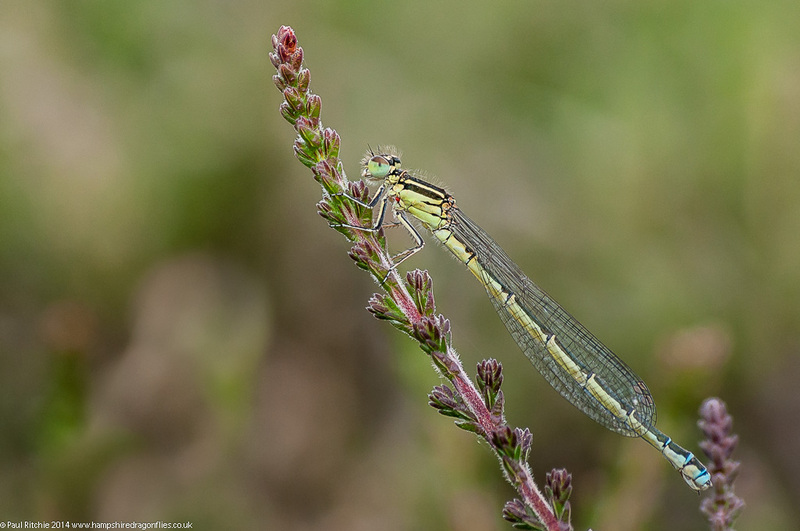 Since My first posting this season of the Scarce Blue-tailed at Latchmore I’ve been another three times. Here are the highlights. A chance to meet up for a full day with Doug is always welcome, and we got stuck in for a good seven hours or so, rooting through the heather and bending in positions no middle-aged men should ever consider. 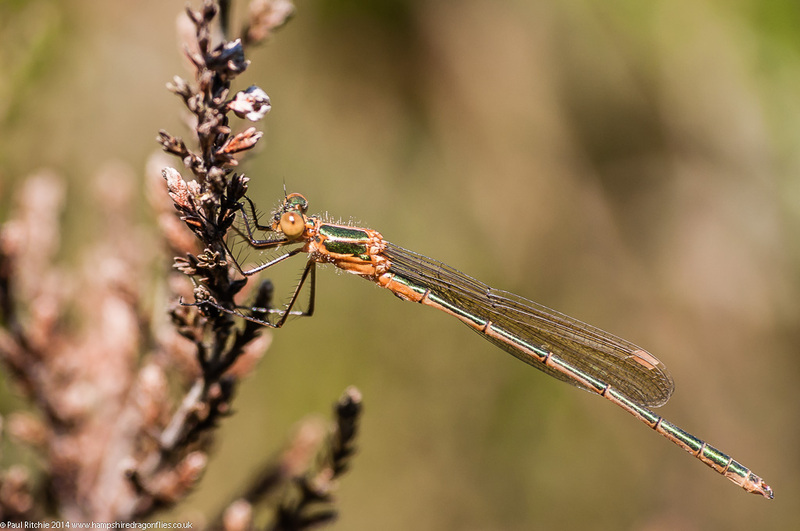 We were well blessed with a good selection of Scarce Blue-tailed, Small Red and Southern damselflies, the best opportunities found ‘off water’. 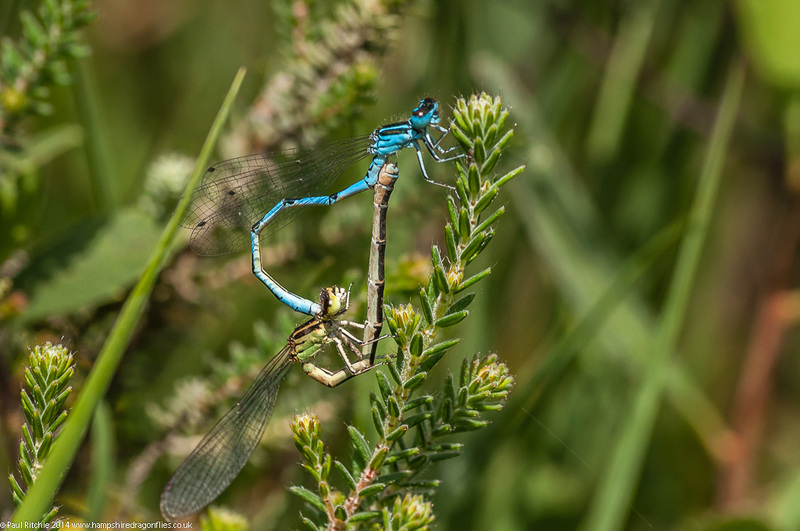 As you will probably notice from the above photo, a good few of the damsels in this location suffer from a mite infestation. Now the picky could opt to ‘photoshop’ the offending blighters out, but this is nature and they’re staying put. 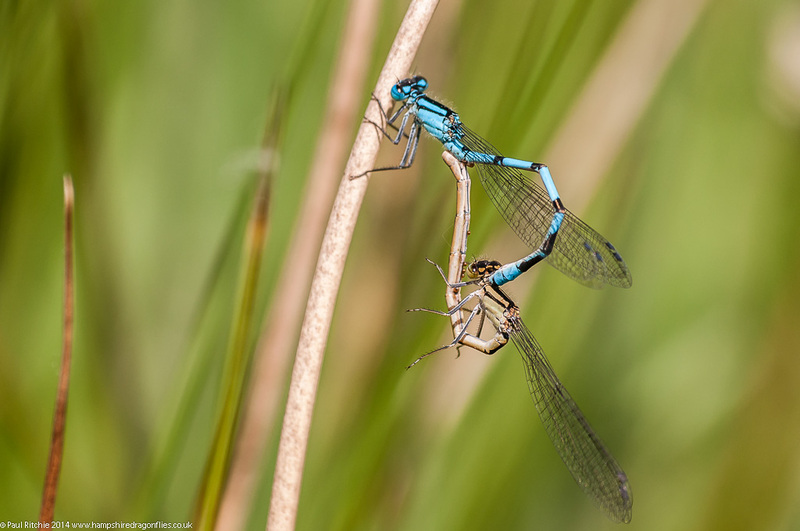 Interestingly the females appear to suffer much more than the males. Thankfully the aurantiaca were mite-free. 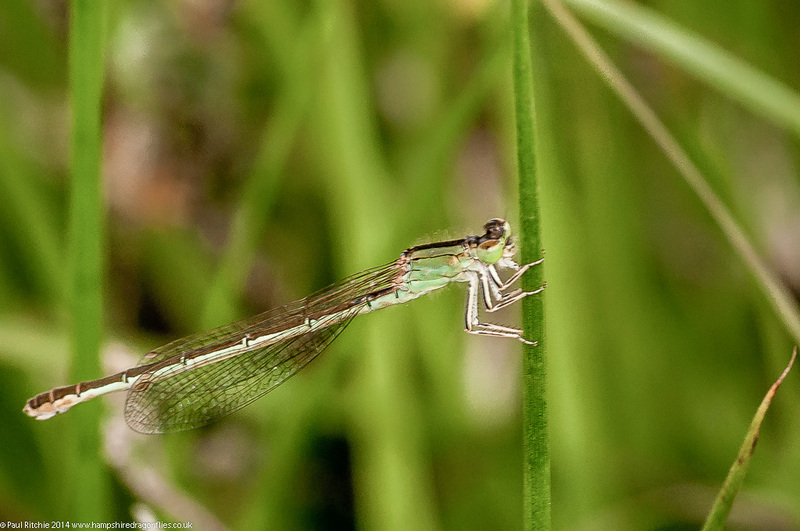 Doug was particularly hoping to find a female Southern Damselfly for some video footage, and this beautiful green-form female offered a good opportunity. The following Sunday I led a trip for Marc Heath, who had made the long journey from west Kent to connect with SBT and Southern. and after stopping for some Golden-ringed moments we were soon joined by a few more Odo enthusiasts – including Colin Plumpfret who had driven from North Lincolnshire. 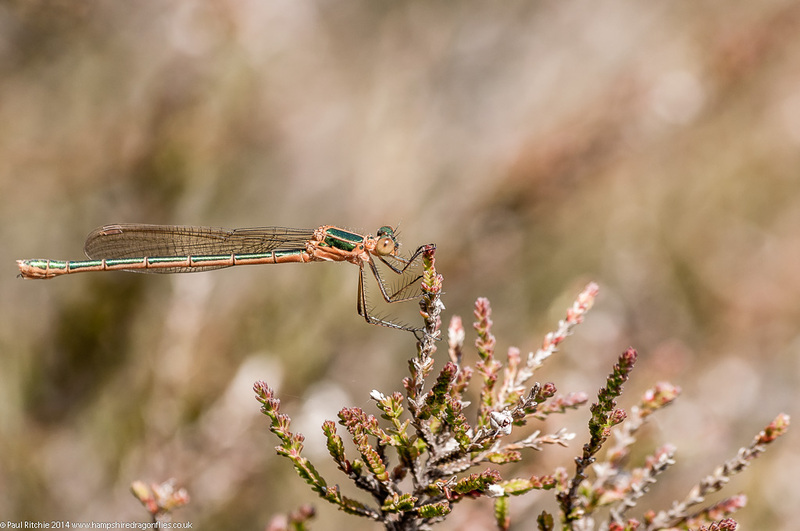 The male SBT were in good attendance in the upper flushes, and while we were searching through the heather the Small Red offered some excellent opportunities. 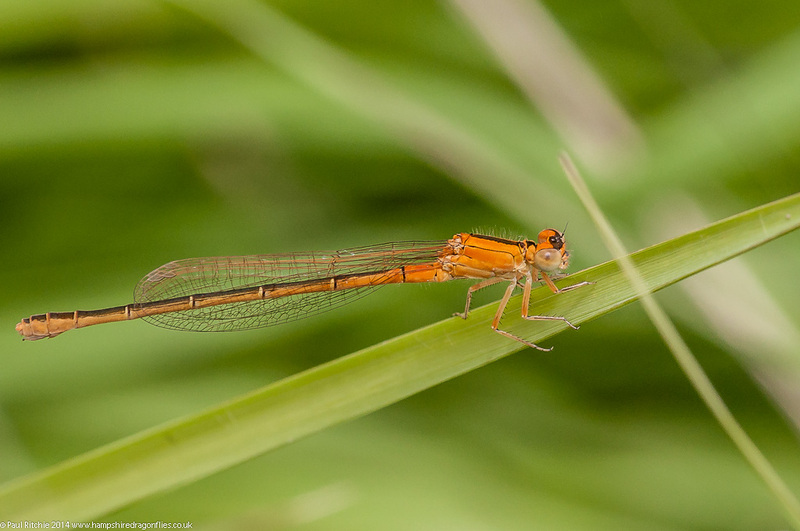 Despite the occasional cloud cover, we had more than enough Scarce Blue-tailed sightings including the sought-after aurantiaca form and even a mating pair. 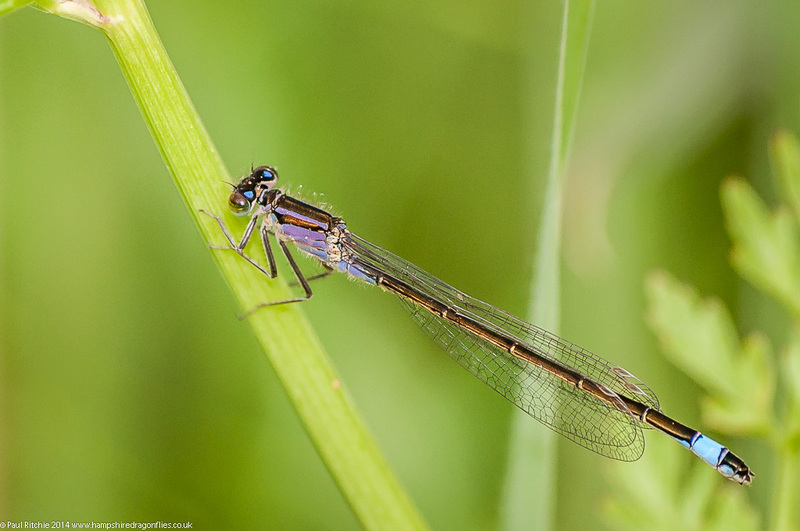 Another highlight of the day was this beautiful blue-form female Southern Damselfly. 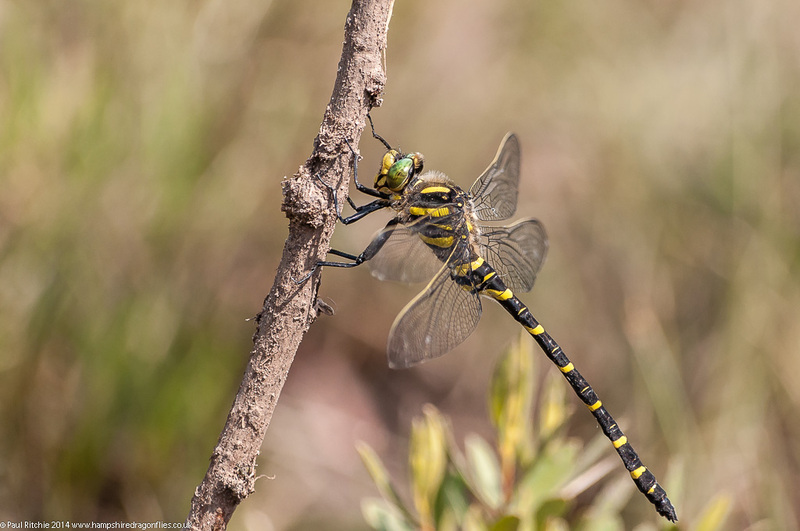 A welcome return for Jerry Hawker and another two visitors from Somerset, Steve Balcombe and Max Thompson, provided some excellent company for this very hot and humid day – certainly the warmest and sunniest this season for Latchmore. The affable conditions meant the stream provided some decent activity with a couple of Golden-ringed providing the first highlight. 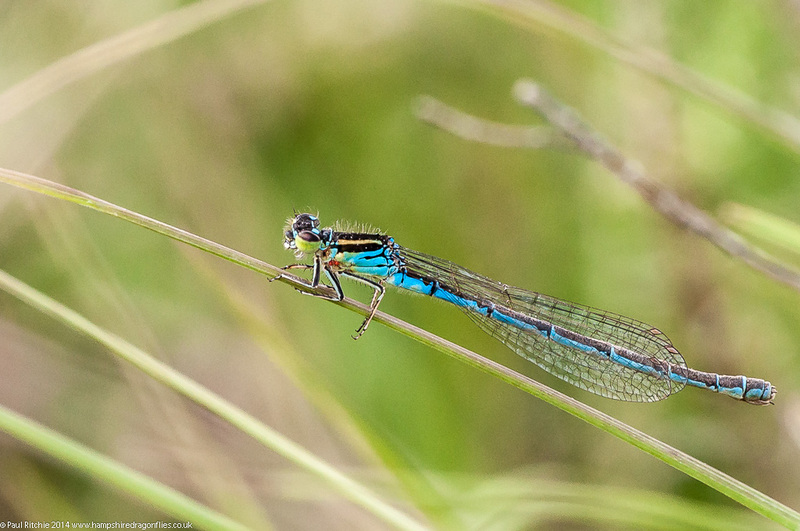 If anything there were far more Scarce Blue-tailed to be seen in the flushes, even bordering the path. The heather once again provided the best opportunities. 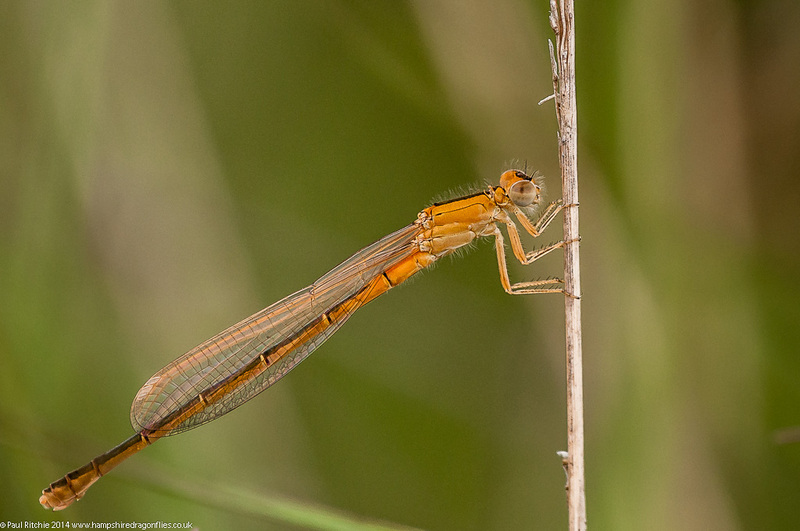 The only disappointment today were the lack of Southern Damselflies. Maybe a little too hot for them? No worries regards Small Red though. 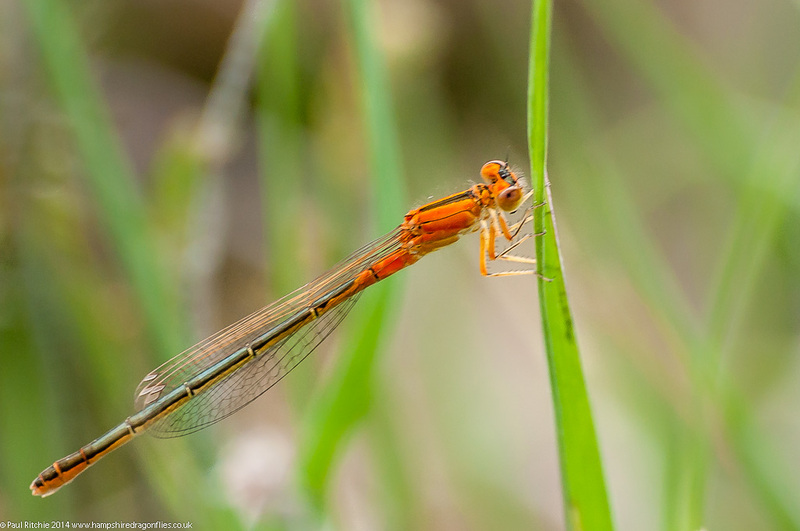 I had to look a lot harder to find an aurantiaca today, but after what seemed like an age (to my knees anyway) I finally caught sight of the unmistakeable citrus tones of a fresh female. I had initially feared that too many visits might dull the excitement a tad, but the presence of good company with the ability for each to find their own treasures made every trip worthwhile. After the disappointment of wasted time Thursday I needed to redress the balance. No walking uneven ground to dead-ends, no traipsing boring gravel tracks for no reward…just a Friday afternoon’s pleasure contained within the basin of Crockford Bottom. I had barely reached the stream before encountering the first Golden-ringed, followed shortly after by another. 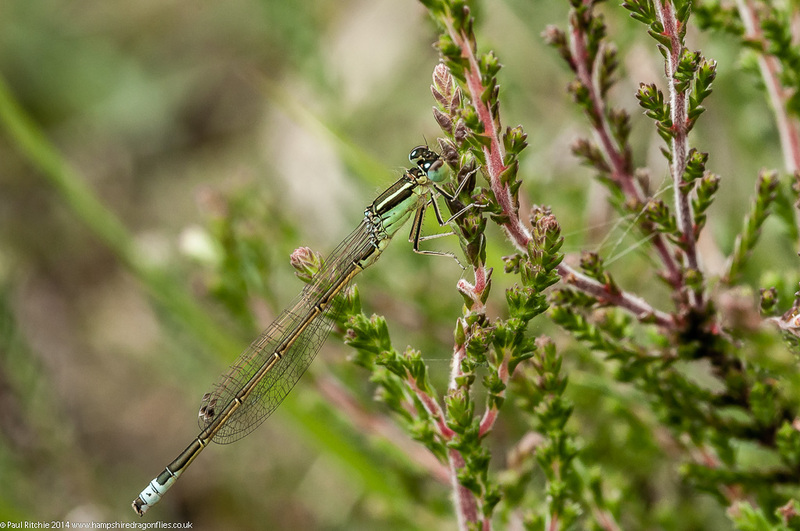 The Bog Myrtle was festooned with Southern Damselflies and the occasional Beautiful Demoiselle, Large and Small Red and Blue-tailed. 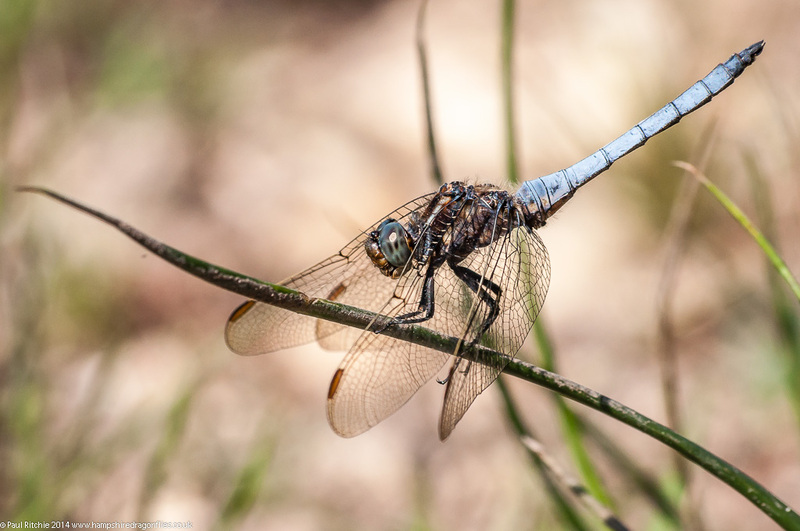 The southern clearing produced Keeled Skimmers, Common Darters and Broad-bodied Chasers. 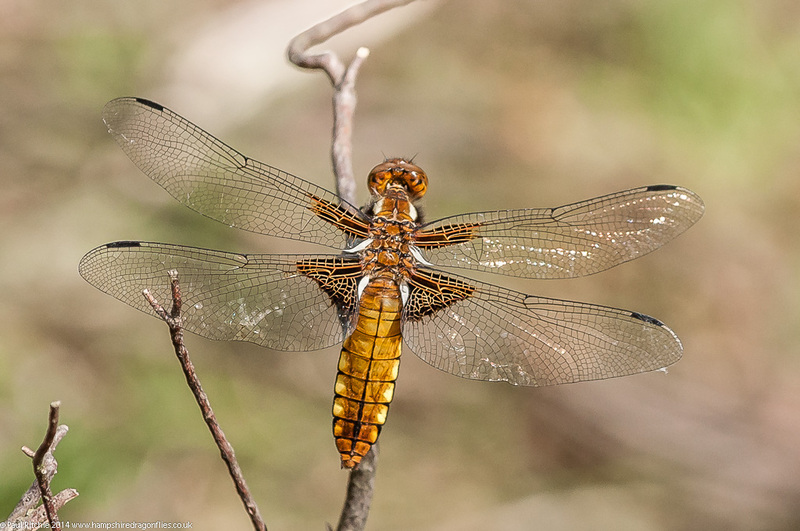 Conspicuous by their absence were Four-spotted Chasers and Emperors. Not one stopped by to join the fun. 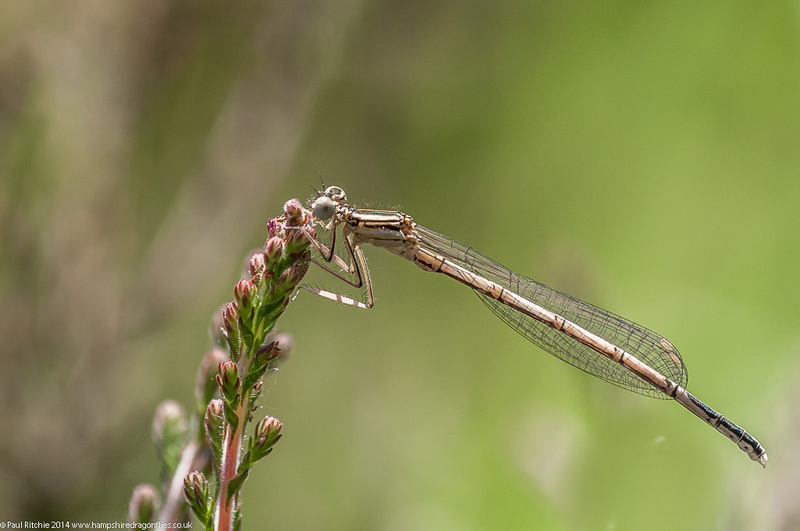 I took a short walk upstream to the sheltered bush favoured by the Southern Damselflies. Back at the main basin I took up camp at my usual grandstand seat and watched the main feature; popcorn substituted by an apple and fizzy drink replaced with water. 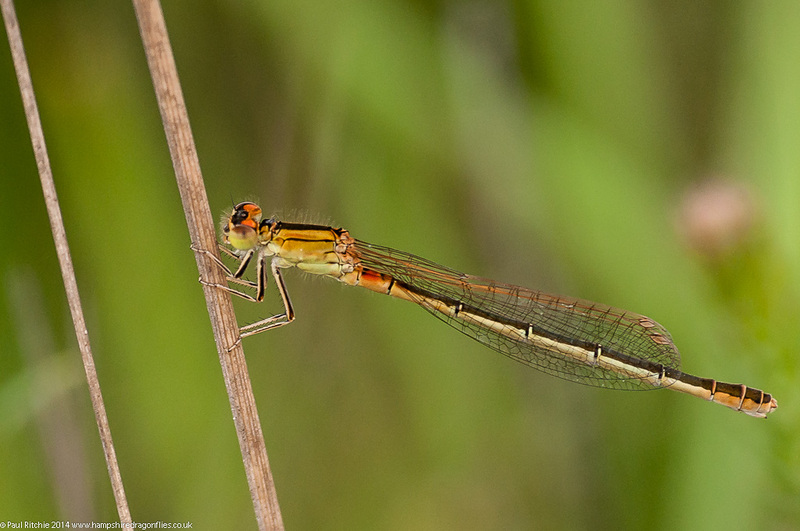 Soon I was alerted to the sound of a female Golden-ringed ovipositing in the darkest corners of the bank. 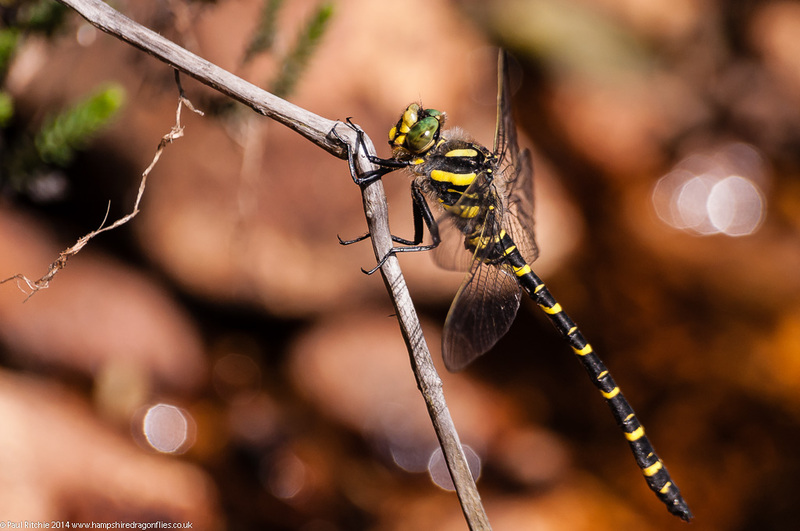 I had found several more males on my walk upstream, and took a few half-hearted shots of them perched on the usual ‘busy’ stick or worse. The resident male at my feet provided a splendid show, circling me and bouncing back and forth along a short stretch of territory and just the once opted for the perfect perch. 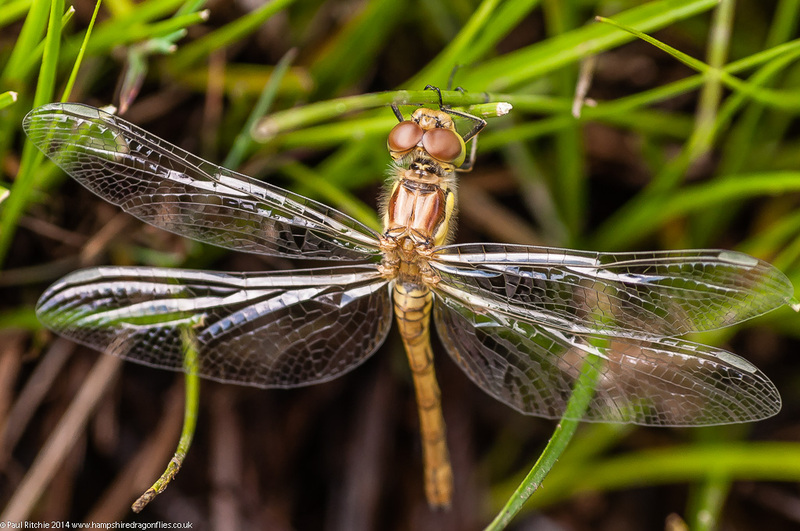 Crockford has still to reach it’s peak for numbers, especially Keeled Skimmers which are usually so populous as to become annoying – not because they’re so familiar, more because they have a habit of pushing any Golden-ringed off his perch before you click the shutter! They were mostly behaving themselves today though, and deserved a snapshot too. I called in again on my way back from an unsuccessful foray around Keyhaven, but numbers were significantly down compared to the previous Friday. 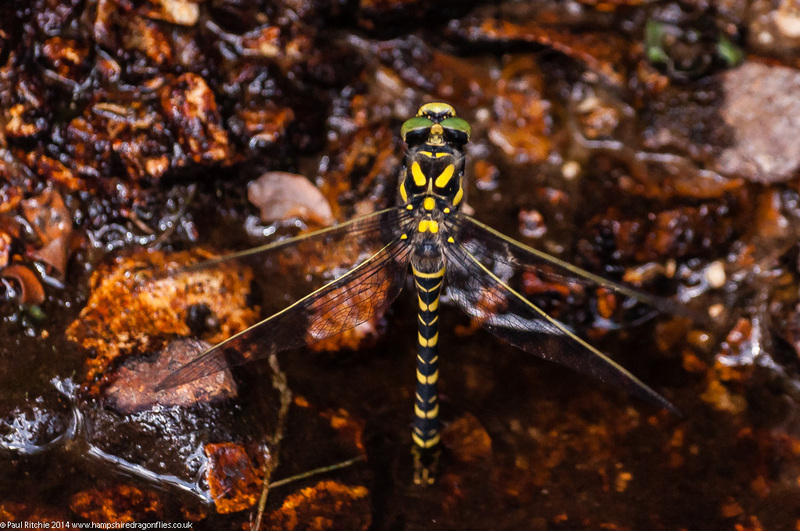 Only a few GR males patrolling small territories upstream. 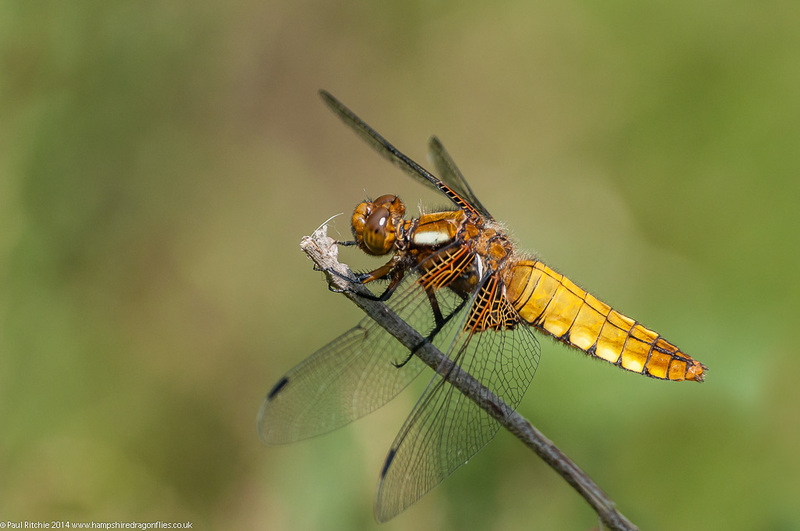 The clearing on the way out provided a male Broad-bodied Chaser this time, already showing signs of wear. It’s always unforgivable not to call in when passing, but to get the best out of Crockford you need to spend a good few hours. Coming up next- Highlights of Latchmore Brook from three recent revisits. Firstly , apologies for the delayed update. For once I can blame the weather with a little more positivity. I’ve a lot to catch up on, so I’m passing over the quieter days and concentrating on the highlights. Too many unnecessary ramblings over uneven ground in pursuit of the elusive means it’s time when familiar favourites are necessary to kick back a little. 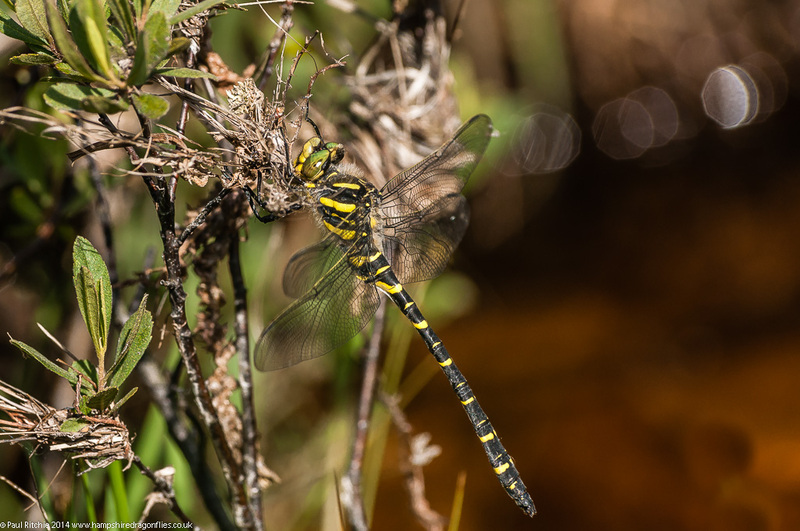 Those who have followed my ramblings should know Ober Water is my favourite of the New Forest streams, and a dragonfly delight in summer. There are two options to start a ramble – either from Puttles Bridge; a little more challenging for those who don’t wear sensible footwear and best kept for weekdays when the car park can become overflowed with day-picnickers – or Markway Bridge; level, peaceful, and infinitely preferable on weekends. Both can be circular or linear, and as easy or difficult as you want, however to get the best out of your excursion you must be prepared to cross the stream several times. 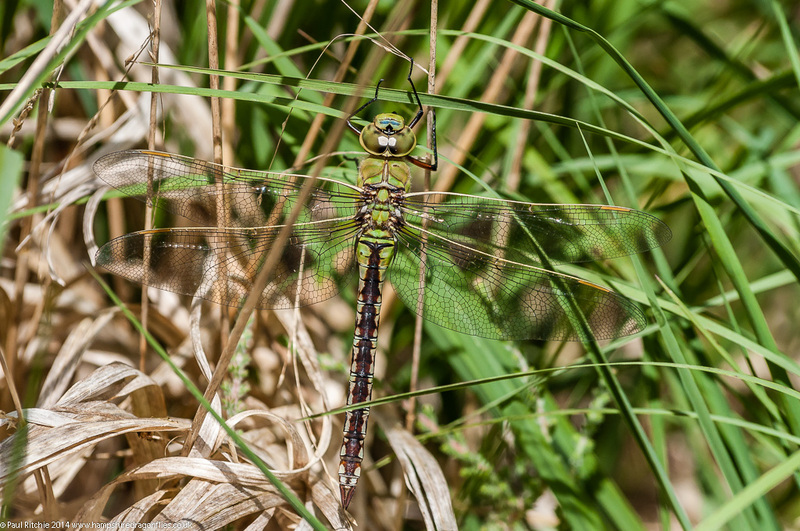 Tuesday wasn’t ideal (those gusts were still bothersome) but was blessed with almost continuous sunshine, and this time I chose Puttles Bridge as a starter point; noticing the sunshine had drawn away the usual numbers of car park dragonfly residents. I neglected the area across the road in favour of the (still very boggy) path following the tree-line until it meets another path at a bridge. 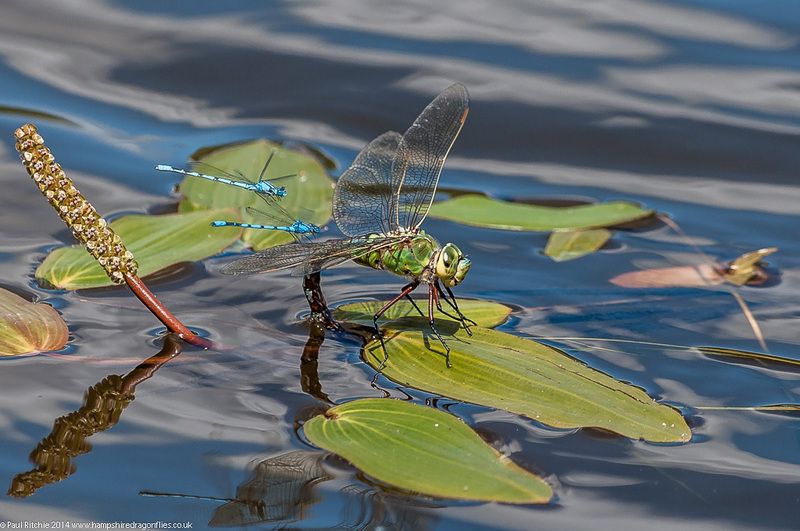 The pool by the bridge had a couple of Keeled Skimmers, Four-spotted Chasers and the usual supporting cast of Common Blue and Azure. 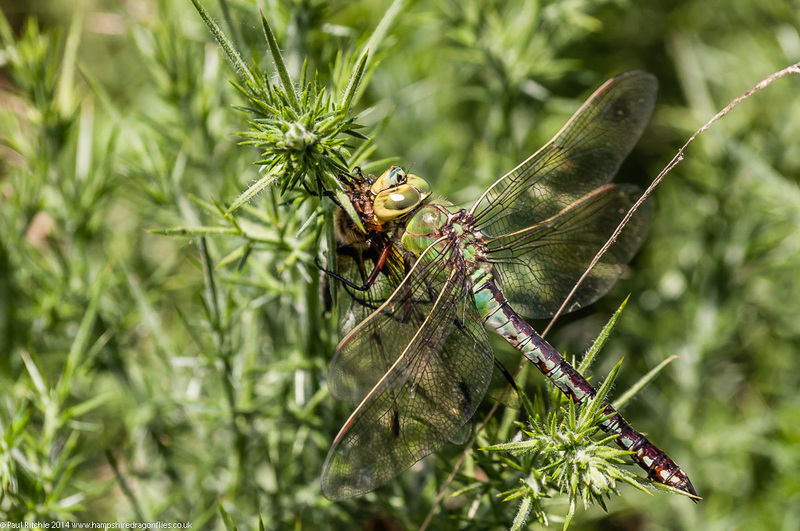 The main path continues along the tree-line, but I chose to skirt around the ferns to join the path down to the stream, throwing up a few more Keeled and a couple of Common Darters in my wake. 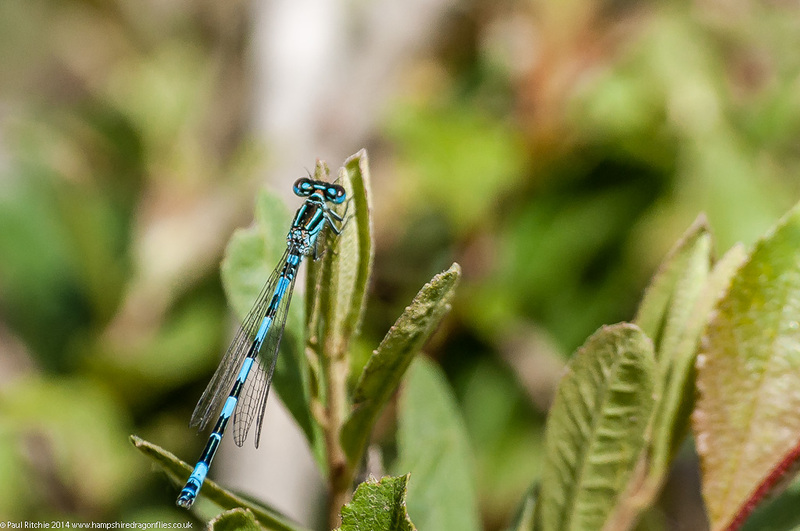 Crossing the stream into the first meadow produced my first Beautiful Demoiselles and a couple more Keeled dancing around the bog myrtle in this sheltered little bay. Continuing through the heather I spotted a few immature White-legged and (unsurprisingly) more Keeled and across the main track at the second crossing were more of the same. I usually encounter a Golden-ringed at this crossing, but they had been absent up until this point. 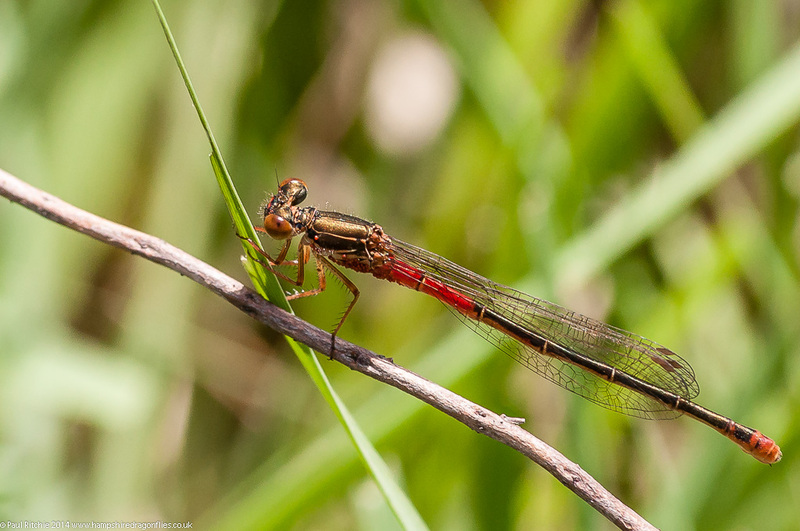 Continuing through the boggy area to the next clearing produced my first Small and Large Red, although the meadow had yet to provide it’s peak bounty. Likewise the heather across the stream. After this third crossing activity was more agreeable with battling male Beautiful, Southern, Large Red and White-legged either in tandem or seeking out a willing mate. 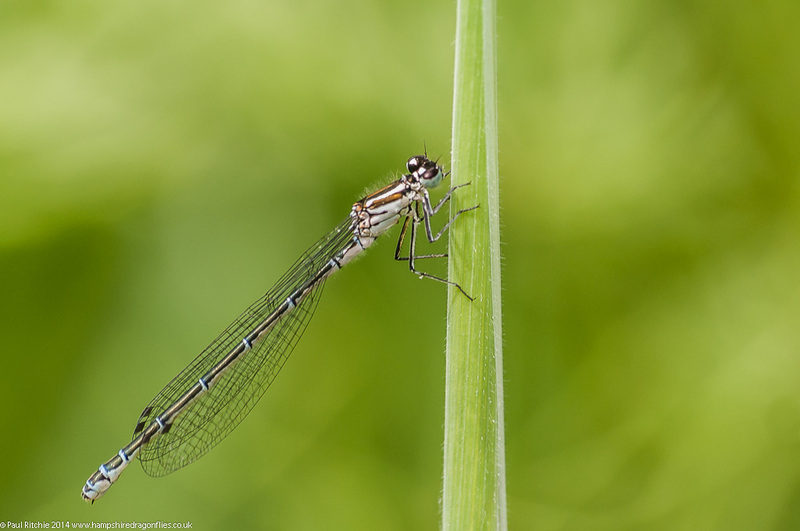 For such a delicate looking damselfly those White-legged can certainly get a shift on and the males cover a large area up and down stream in their quest. At Rhinefield Bridge, the pool was devoid of any action due no doubt to lack of shelter, but across the other side were more of the same, increasing in frequency and numbers further upstream. At the flush I searched for any signs of Scare Blue-tailed, but if there were any they weren’t visible, only some Common Blue-tailed adding to today’s count. Crossing the stream for the fifth time I followed the bank until I reached another of my favourite spots and stopped for a spot of lunch. If you sit long enough at this point you can pretty much see all resident species pass through, but for now just more battling Beautiful, Southern, Large Red and White-legged and a few Keeled, but not nearly as many as peak time. Still, there’s plenty of time yet. Back across Rhinefield Bridge I had my first sighting of a Golden-ringed, a female passing through, stabbing the water looking for a suitably shallow gravel base. 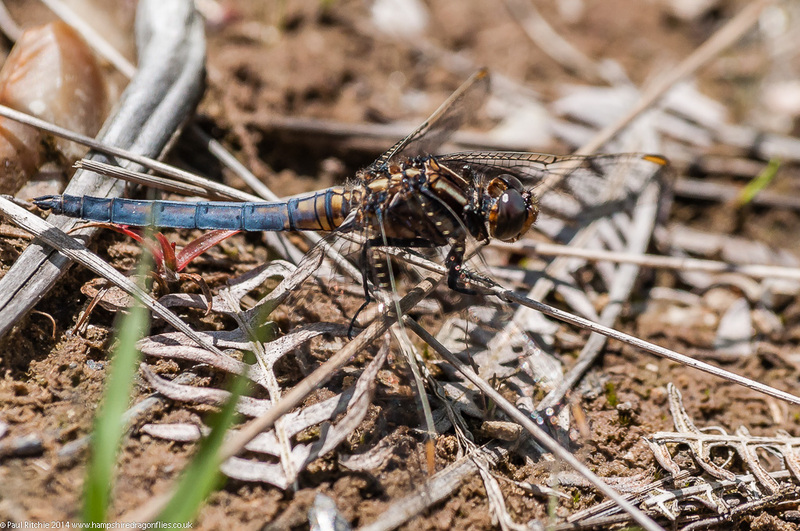 Not too long after a male passed through in the other direction looking for his own territory, disturbing a male Broad-bodied Chaser. A slight deviation on the way back to join the very soggy path bordering Clumbers Inclosure before returning once again the the pool by the bridge where the same cast minus the Four-spotted carried on their endless parade. Had no-one bothered to mention it was Friday 13th and a full moon, I probably wouldn’t have noticed. Not that I’m superstitious, although there were a few examples of random chaos throughout the day. I chose to go out a little later and take it easy, missing the first accident on the A31 but getting held up by the second. Luckily a brief hold up and in no time the road was surprisingly free-flowing to Ringwood. 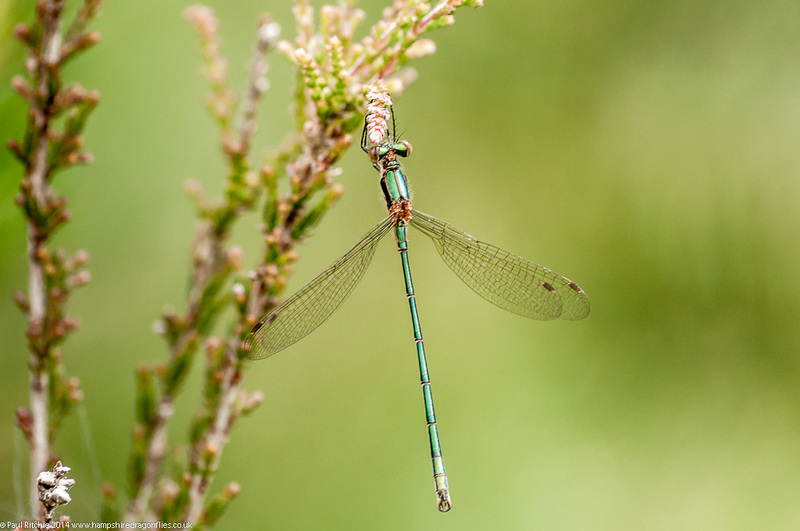 I knew the long walk in would be rewarded with a good selection of Common Emerald Damselflies. Sure enough the key pond had a good population. 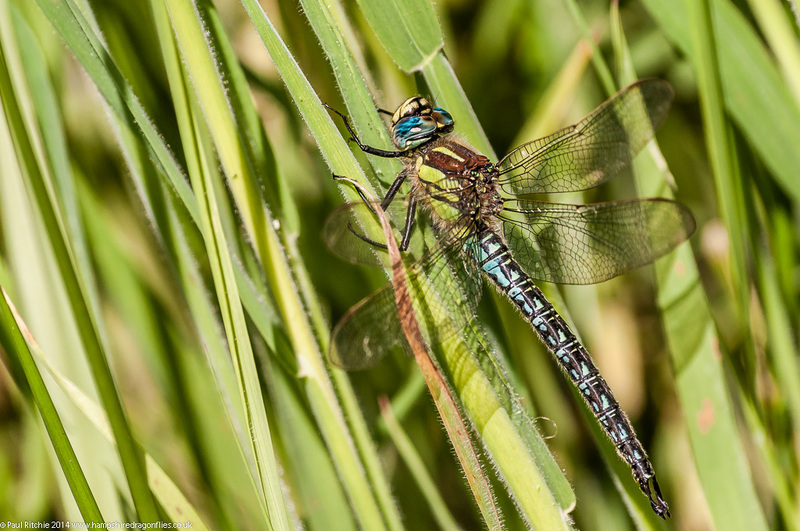 Besides the Emeralds there were a couple of Four-spotted Chasers and an Emperor, but something didn’t seem quite right? Certainly not as much water activity as I expected, with most of the other ponds sorely lacking. There were varying amounts of cloud which exaggerated the very humid conditions. After a trek around the common I was certainly feeling damp. Having found nothing else to make me stay put I decided to take a leisurely drive back via Burley Heath. Feeling uncomfortably fatigued I thought a perch by the side of Burbush Pond might refresh the senses – it was far to early to call it a day. Even here activity was subdued, with all except last Sunday’s Downy present. 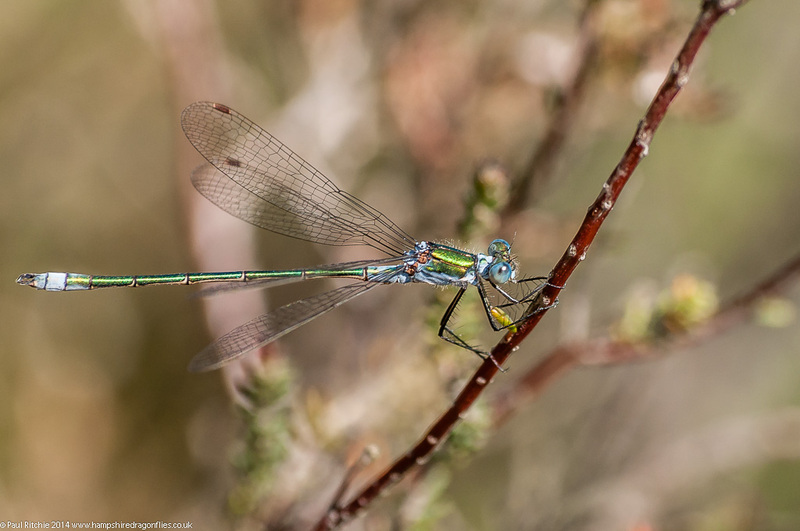 I’m sure the high humidity didn’t help much, so I busied myself with more Common Emeralds among the heather. Also happy to see the heath had a few fresh Silver-studded Blue butterflies to add variety. There was a superb population across the old railway line until they cleared the heather. 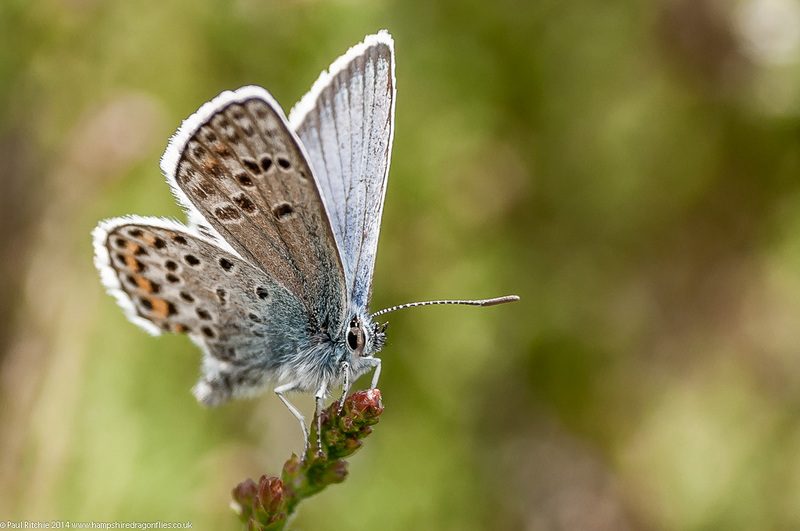 Besides the Emeralds, there were good populations of Common Blue and Azure within the heather and even a few Small Red – the old railway being a real hotspot for them. 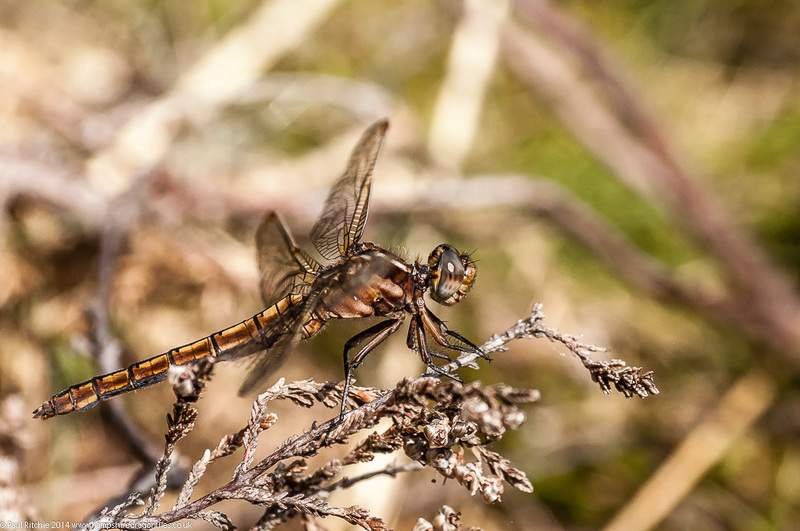 Also hiding in the heather was an immature Keeled Skimmer. 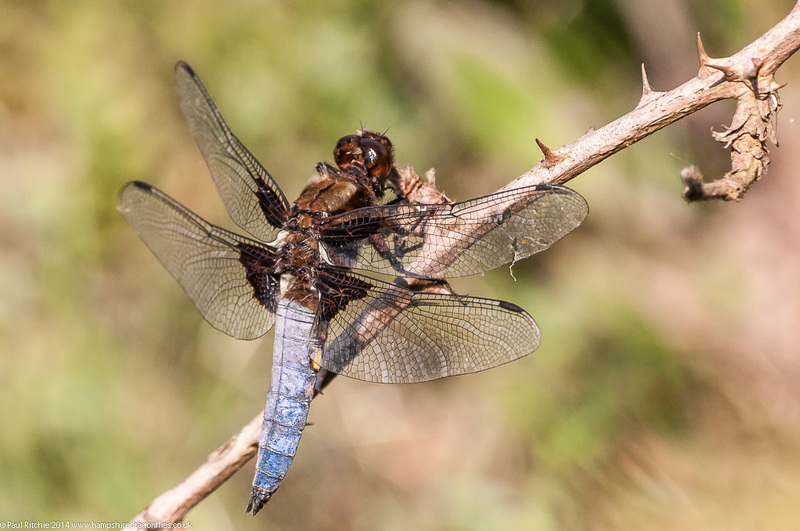 Satisfied I wouldn’t find too much more I walked the path back to the car park, stopping at a favoured clearing where Broad-bodied Chasers like to hang out. Superstitions aside, a short afternoon excursion in the forest turned out worthwhile in the end. And I was considering a day of rest! 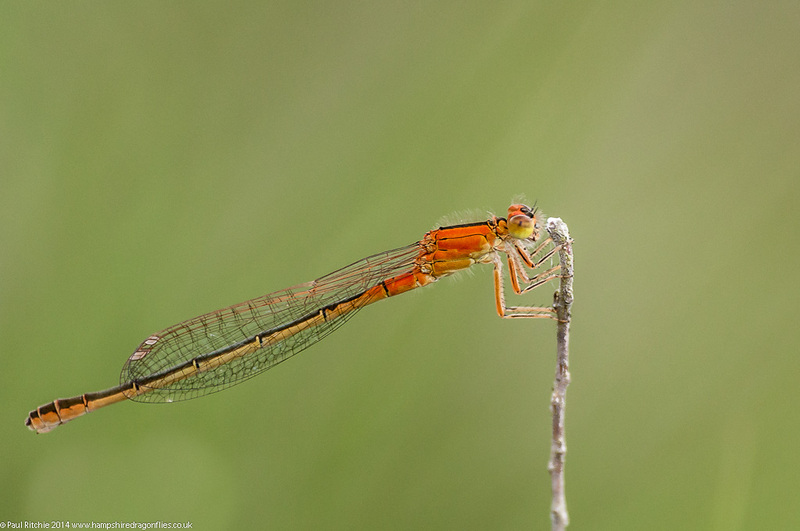 The drop in wind on Wednesday was ideal for a revisit to Latchmore Brook. The downside was a belt of cloud which appeared to follow the length of the stream, reluctant to open up at first. 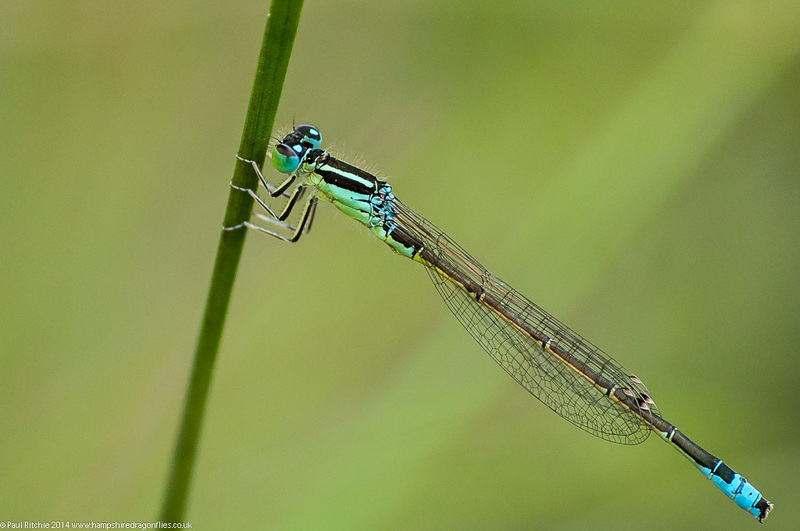 Thankfully the Scarce Blue-tailed were here and in good numbers at the first flush after crossing to the north bank. 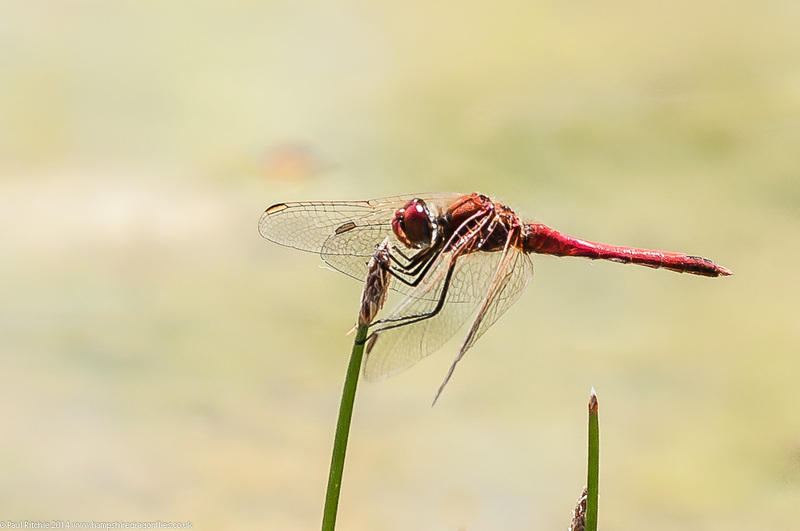 A good dozen or more males were decorating the length of the flush, and deep down in the emergent vegetation was a recently-emerged Common Darter – another new species for the season. Making my way to the main area, I searched the surrounding heather and grass for glittering prizes, and struck gold with a pristine aurantiaca. Walking up the mire towards Gypsy Hollows a few teneral Keeled would rise and fall from the ferns, while closer to the stream were a decent number of Southern. 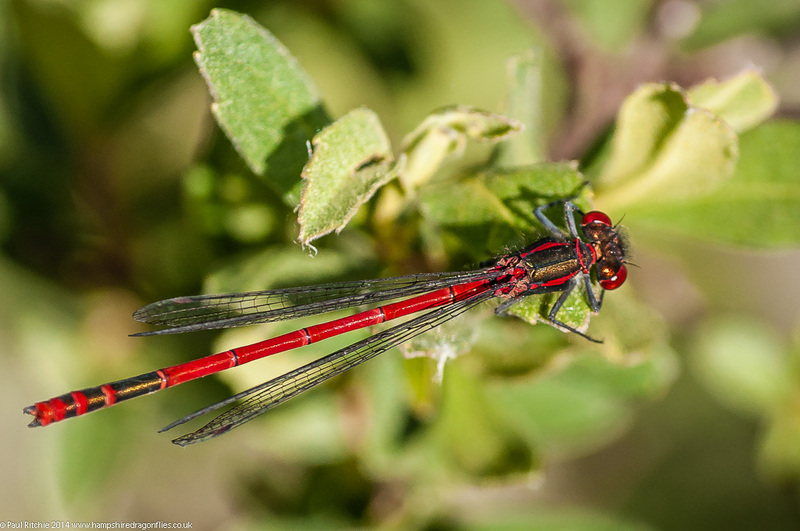 Also scattered among the foliage were a few Small Red. 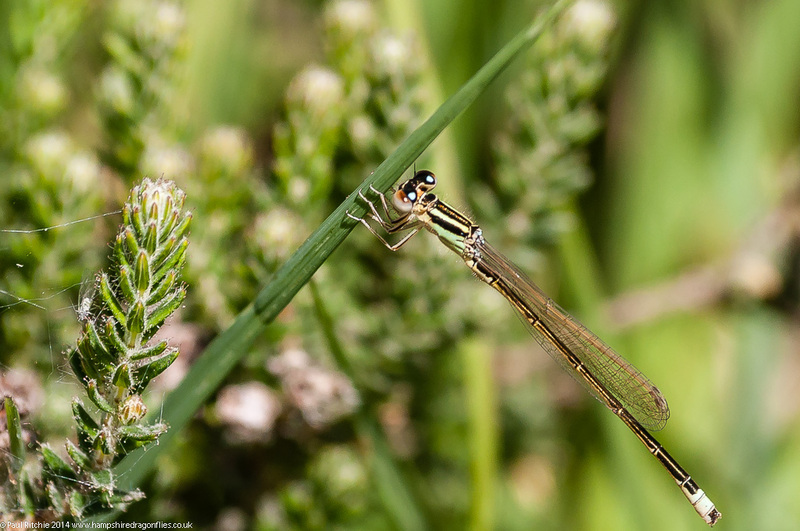 Back downhill I carefully stalked a mating pair of Scarce Blue-tailed, the completion of my set – and more than I could have wished for today. The perch they had chosen was both low down and swaying in the light breeze; something not even a tripod could overcome. Also potentially disastrous were a small herd of browsing Mares who were gradually drawing closer, at one point threatening to devour my quarry. Thankfully they rose beyond their reach before disaster struck, and I let them be. Having had far more than I could have wished for I finished early, not wishing to push it. I’m finding it a little difficult to catch up this week. A perfect period of sunny weather has seen me out in the field rather than hunched over a PC. Instead of a huge multi-day post I’ve decided to break it down into smaller portions. .I began by trying to locate the opening where I saw two chaps exit on the previous visit, and my first attempt led me into a superb scrubby clearing. 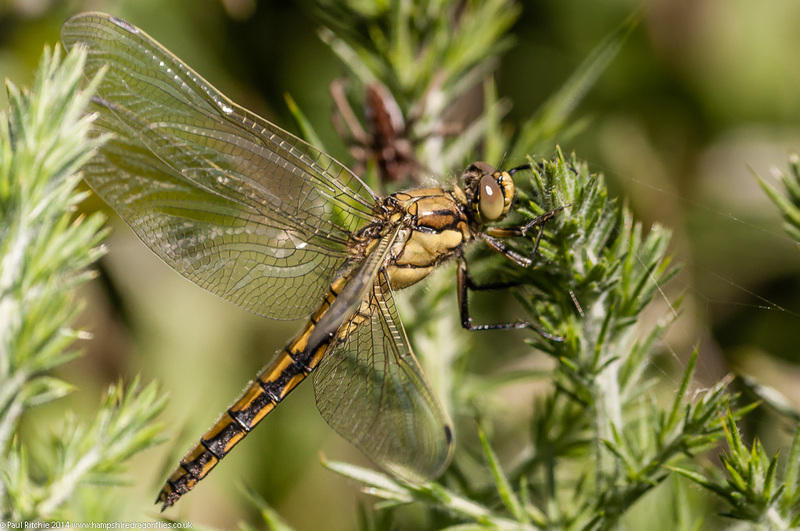 I must have disturbed at least half-a-dozen Emperors, countless Black-tailed Skimmers, Four-spotted Chasers and a fine host of Damsels. I could’ve spent the day in this clearing alone, but I was focused on locating the pond which still eluded me! I ended up going around in an extended circle, leading right back to where I entered. Slightly miffed, but unperturbed, I attempted to find another entrance by back-tracking and circling to the north, only to find a fence and ditch thwarting any attempt. I followed the track to the east and found an opening which was a sort-of path, albeit littered with fallen trees and foot-wrenching scrub. 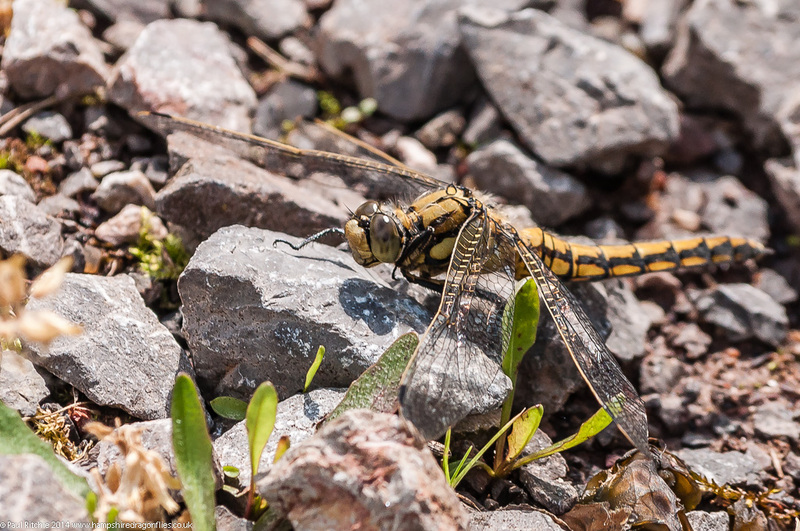 However once I fought my way through I found myself on the northern shore; a nice, large area brimming with teneral Black-tailed Skimmers and a wealth of other surprises. I spent some time in this area searching the scrub and investigating the shore, noticing a couple of beach-type accessible areas on the opposite bank. But how to get there? Certainly not from here as the far side of the clearing was a frustrating cul-de-sac. I fought my way back to the eastern track and continued looking for other points of entry, until I reached the track which runs to the north of Long Water. While searching the small clearings opposite the shore I noticed a teasing gap near the far end. Here at last was a way in. 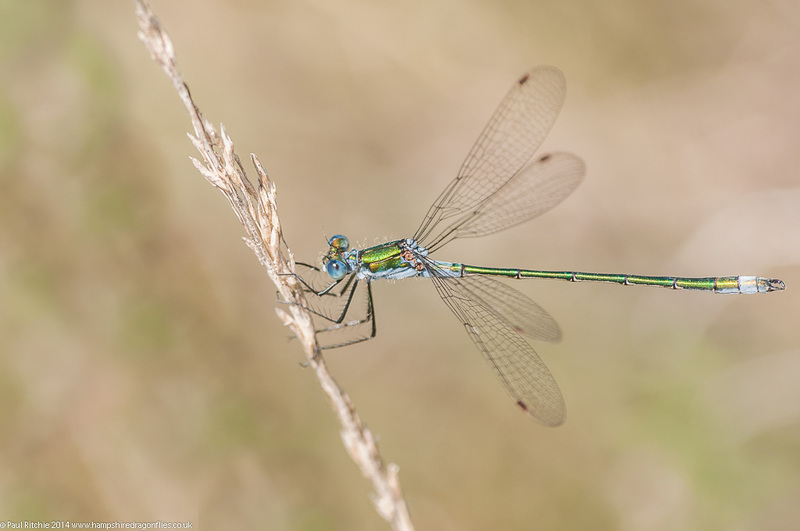 The water’s edge was alive with Common Blue, Azure, Blue-tailed and Red-eyed Damselflies with Four-spotted Chasers and Black-tailed Skimmers battling with each other and the occasional Emperor. The second little beach had more of the same and my attention was grabbed by a rustling in the reeds. 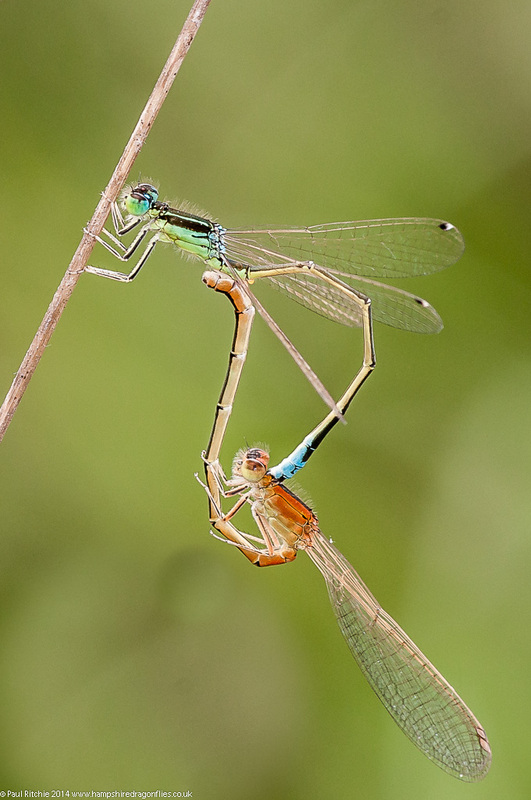 Further investigation revealed a female Emperor who had seized an unfortunate Four-spotted Chaser. She precariously rose with her substantial prey and alighted a short distance away. As I was grabbing a few shots I was audibly aware of her crunching away the head and starting in on the thorax. 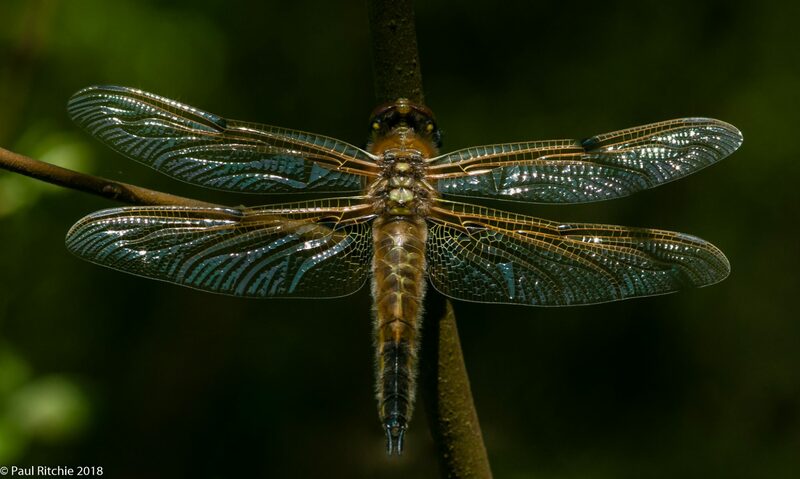 I always thought the wings would be discarded first, but as you can see the wings are still attached. 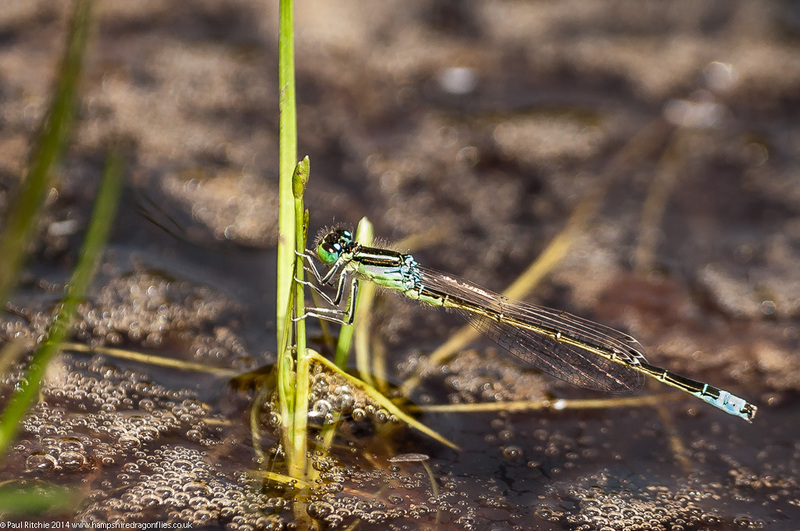 She allowed me enough time before rising again – out of reach..
On the third little shoreline I had a male Downy fly through briefly while I concentrated on some Red-eyed opportunities. Returning to Long Water I explored the southern shore, finding endless enjoyment from the increased activity with every new sunny spell. This is what it’s all about, and I wasted many minutes until returning to the car for a spot of lunch. I knew immediately as soon as I returned to the car I’d get itchy feet for Warren Heath, which was to close to ignore. I avoided any attempt to search the upper valley and instead concentrated on the path along the stream to see what wonders it would throw up today. At least the activity on the water was better than a week ago, if still a little subdued. Unfortunately no showing of Brilliant Emerald today, but a Downy kept me occupied. I often blame the BBC weather forecast for promising sun when the reality is gloom. On Saturday I blamed them for promising rain & thunder, but at the last minute this changed to a fine afternoon! I know this isn’t a revelation, but I was really looking forward to a rest. 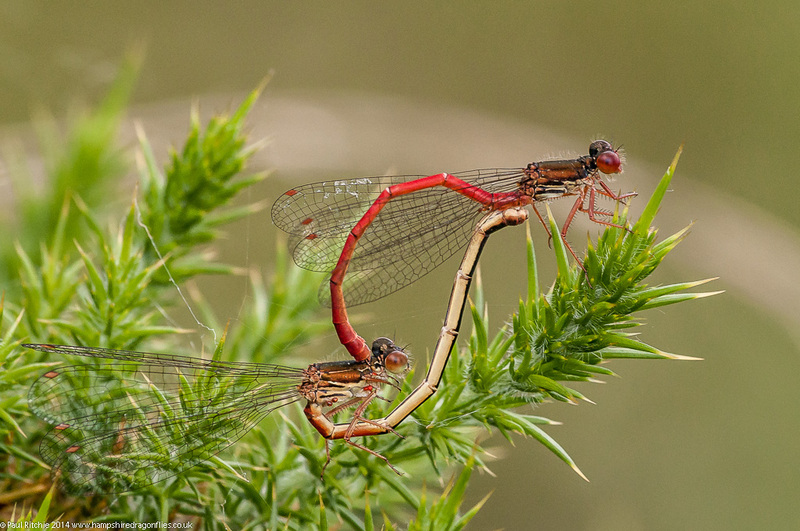 As it was our plans changed with the forecast and we headed out to Badminston in the hope of reconnecting with those Red-veined Darters. Arriving at midday we bumped into Paul Winter, who had already connected with the RVD at another small pool a short distance away. The male returned on a couple of occasions and proved difficult to pin down, although finally allowed a distant perched shot. We did have one visit another pool briefly without stopping and a site search failed to produce any more over the course of the next 5 hours. To be honest it was very much needle-in-a-haystack, the best option being staying put at a chosen pool and waiting in hope. At least a walk produced a little more variety. As it was still the weekend I returned reasonably early the following morning expecting to find a few twitchers, but during my two hour stay only noticed one individual who seemed reluctant to jump the fence. 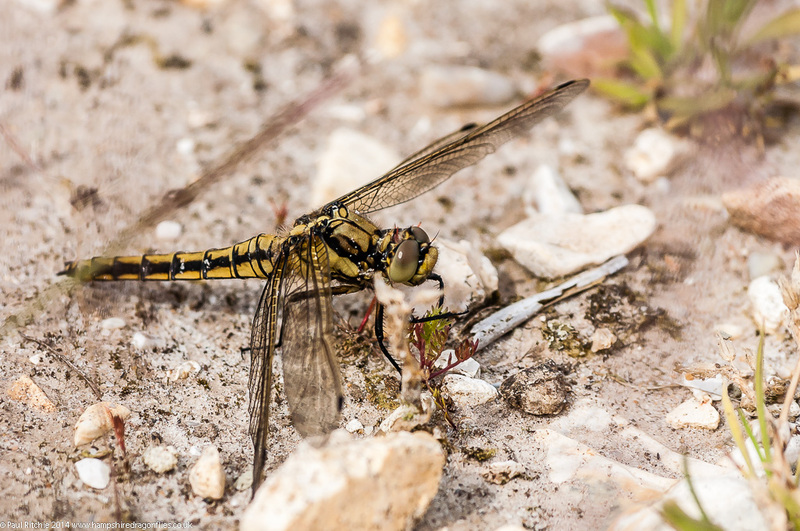 Suffice to say I had no further sightings and quite honestly was getting very bored indeed, having only a Black-tailed Skimmer occasionally come in to patrol before disappearing. 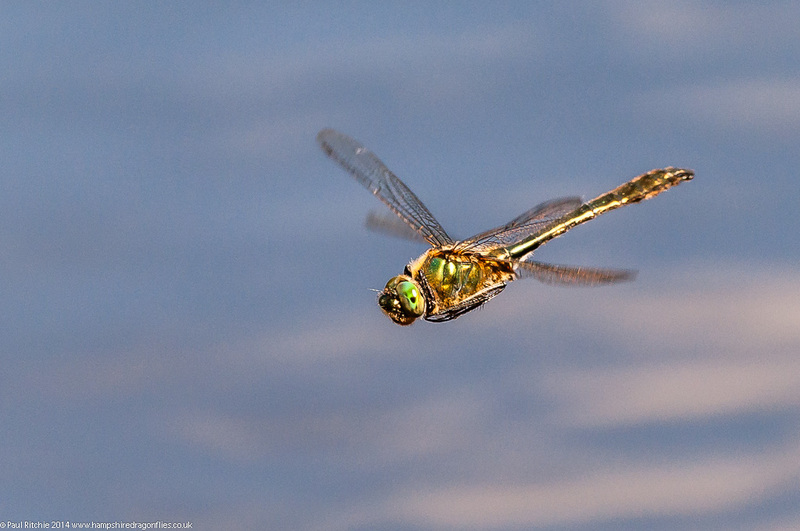 On the way out I amused myself with a male Emperor who was patrolling a wide section of one of the channels. Barely a few metres away another was claiming his patch. While I was busy wasting my time further east I received a call from my good friend Doug who was having a whale of a time at Burley, so I fought the grockles on the drive over to join him for an hour or so. 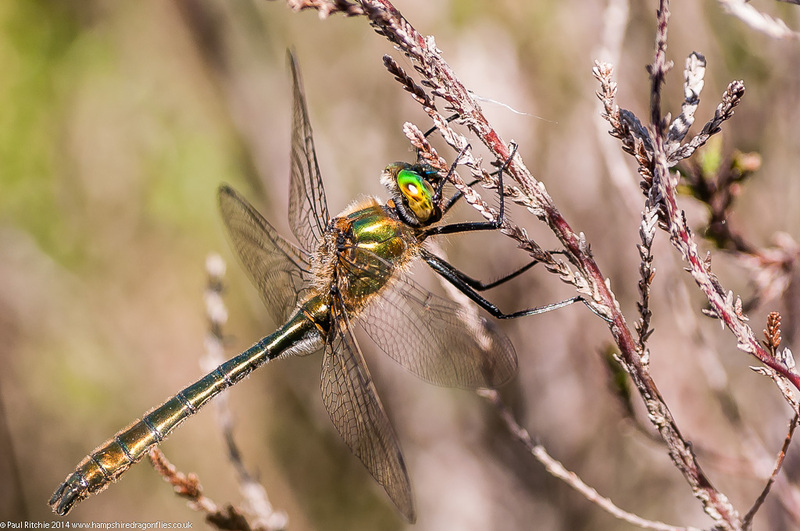 This pond was more like it – a good showing of Emperor, Four-spotted and Broad-bodied Chaser, Black-tailed Skimmer and Downy Emerald across the water while in the foliage I connected with (Common) Emerald Damselflies for the first time this season, several teneral male and female decorating the heather bank. Doug was still obsessed with the Downy, eager to get some decent shots along with some video footage, knowing full well that he’d need a lot of luck and a smattering of skilled stealth to get anywhere near with a tripod. While we were taking a refreshment break, his quarry set down in the heather less than a couple of metres in front of him. If that isn’t an invitation I don’t know what is. Once Doug finally achieved his goals I grabbed a couple of shots for myself, as this male looked superb with the sun falling directly on his reflective brilliance. 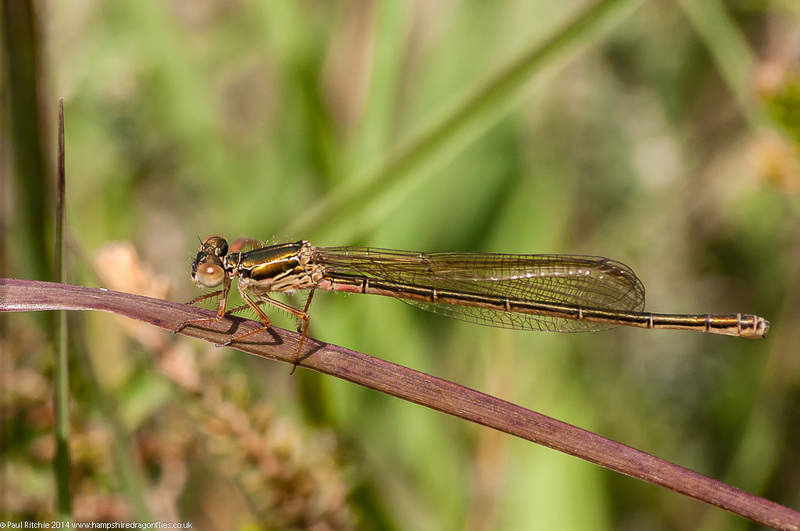 On a couple of occasions a female Emperor came in to oviposit. It was both relaxing and productive to catch up briefly with Doug doing what we both enjoy without expending unnecessary energy and we both could have stayed there all afternoon, but alas we both had to finish early in the spirit of domestic harmony. If anything Friday was the better of the two days weather-wise. Plenty of sun but still that tedious wind – albeit from the opposite direction. Certainly enough to blow the cobwebs off the heather at Ipley Cross. 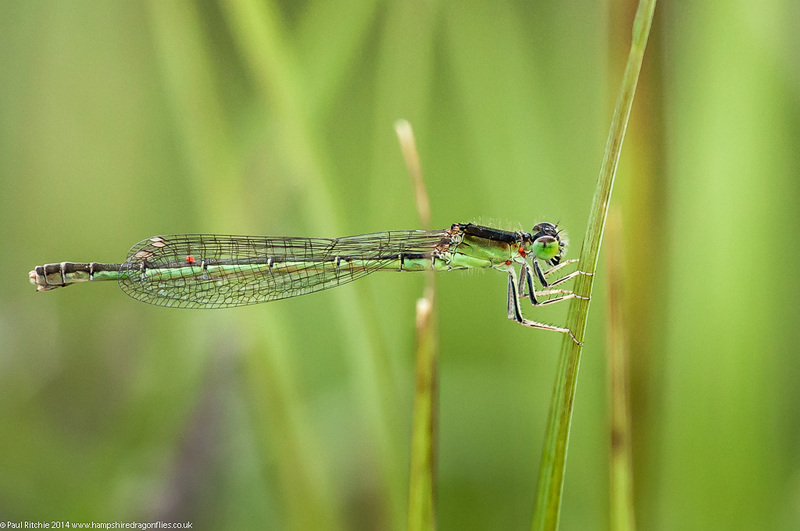 Suffice to say I saw no hoped-for Emerald Damselflies fluttering on the breeze. It’s possible they were around, but after the uneven ground of yesterday I didn’t persist. 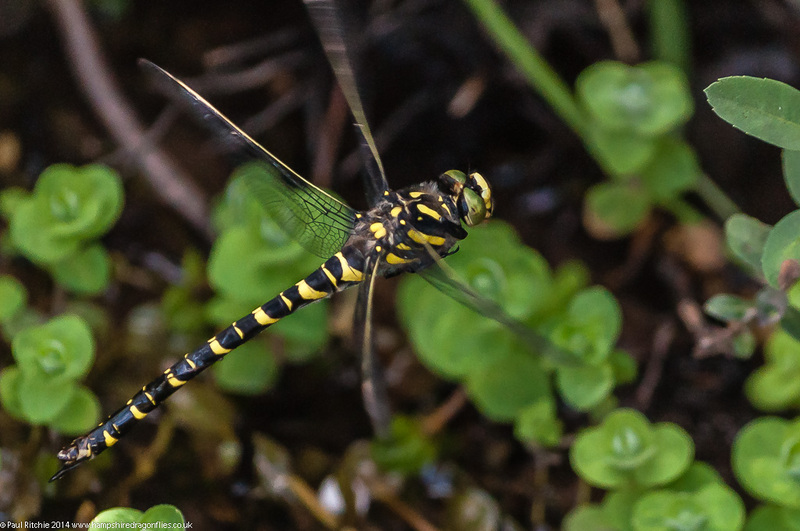 As it was there were a few teneral Four-spotted Chasers and an Emperor at each pool. 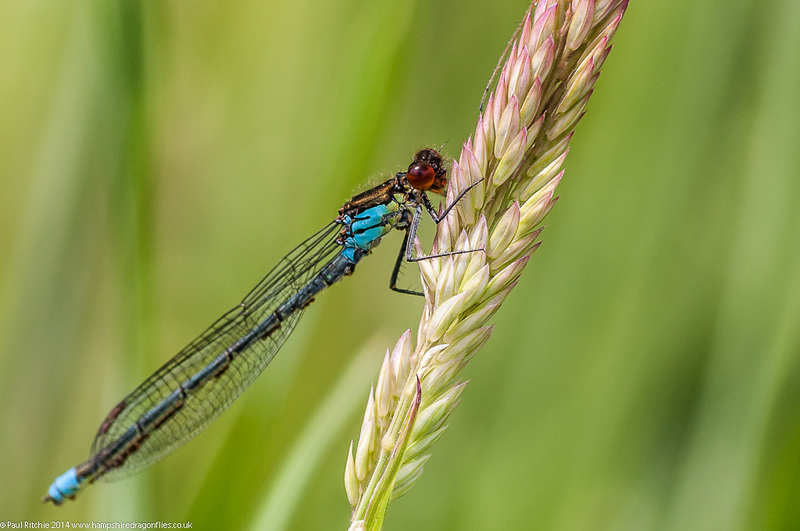 A brief call in at Crockford offered probably my best experience of the day with enough Beautiful Demoiselles, Keeled Skimmers, Broad-bodied and Four-spotted Chasers and the odd Black-tailed Skimmer to keep me occupied. 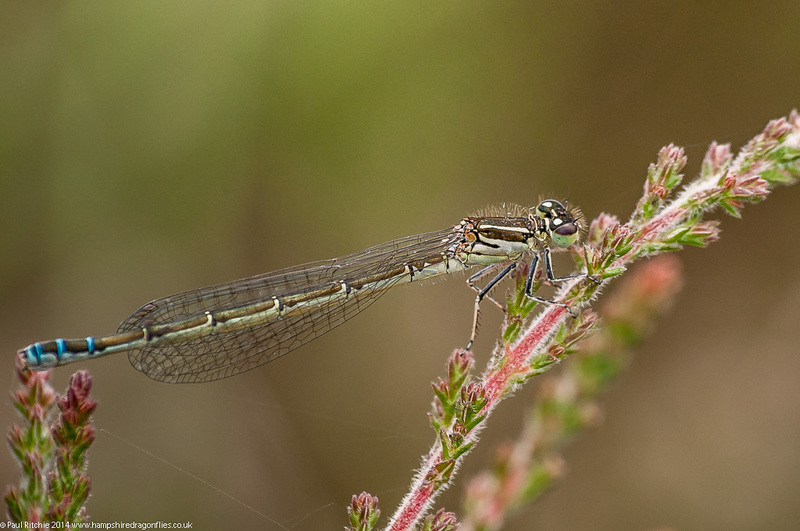 The highest populations were Southern Damselflies, my first chance to catch up with the species this season. 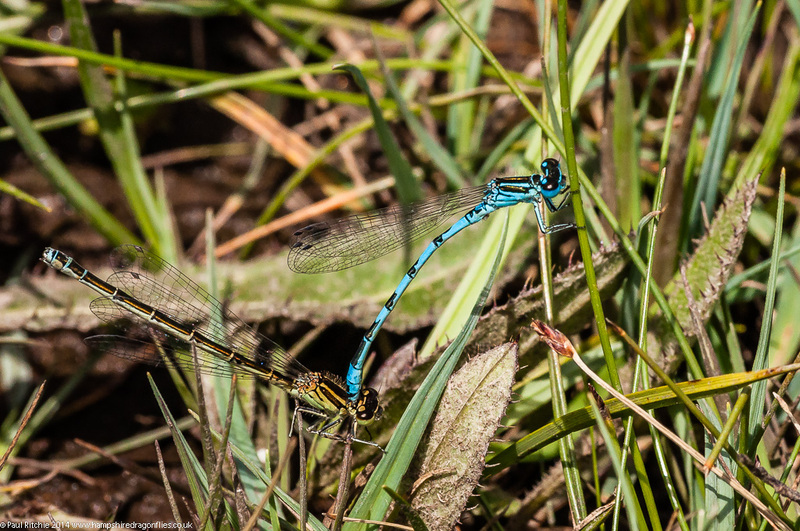 Besides the Southerns there were a few Blue-tailed and Large Red. Curiously I find the Large Reds at Crockford a more vibrant red than usually encountered, unless yesterday’s North Hampshire encounters were stuck in my memory; a more drab, matt appearance. 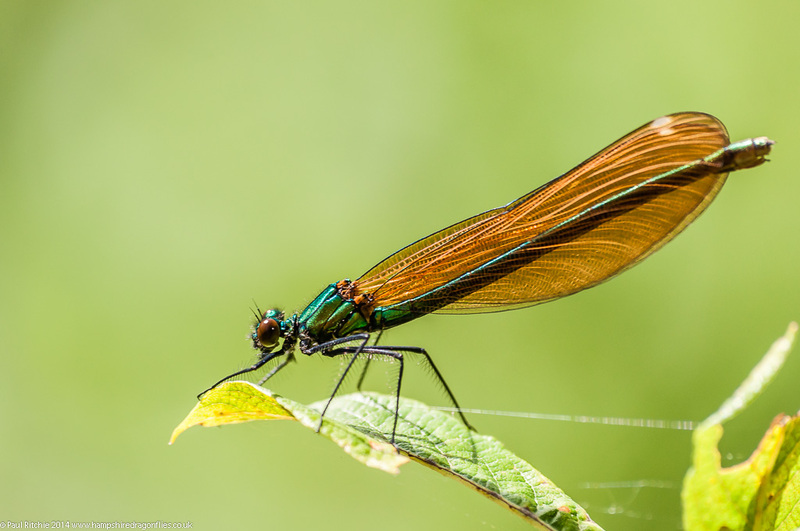 I couldn’t leave without taking advantage of a perfectly-poised Beautiful Demoiselle. At Pennington the undergrowth had reached 6 feet high in places; Certainly in need of a trim. 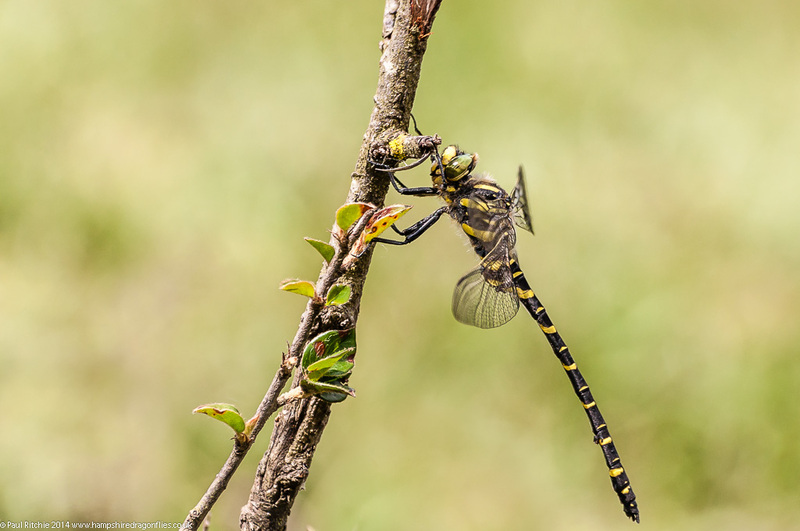 The thickness of growth hindered rather than helped, most odonata in my experience preferring to perch along the margins or in small open clearings, certainly with the ability to bask and keep an eye out for predators. 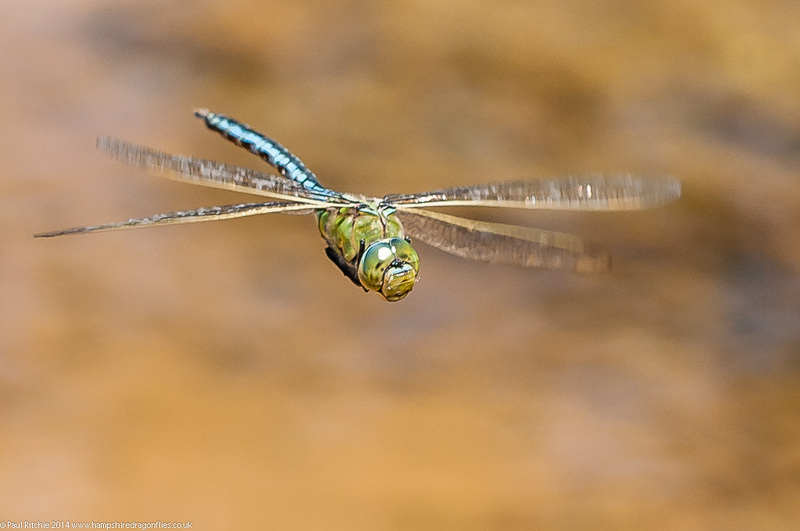 At least there was a little over-water action with a couple of male Emperors and a strong showing of Azure, mostly in tandem. 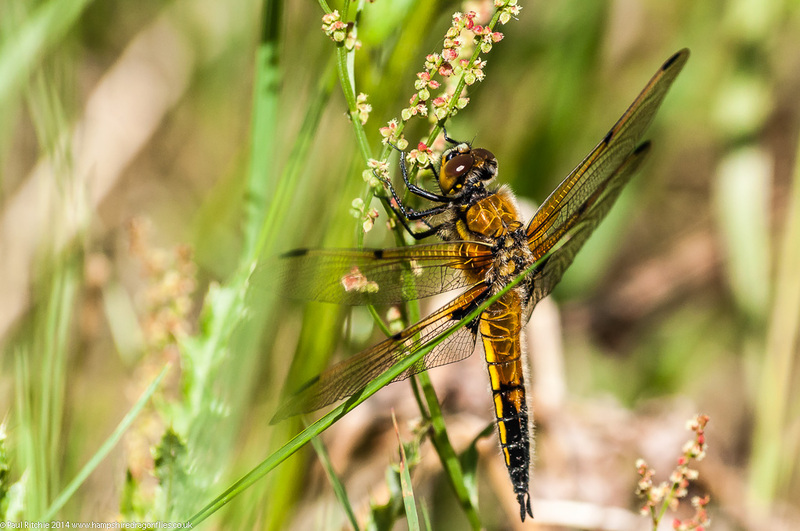 Again a few scattered Large Red, Blue-tailed and Red-eyed, some Beautiful Demoiselles and – yes, you’ve guessed it – Four-spotted Chasers. 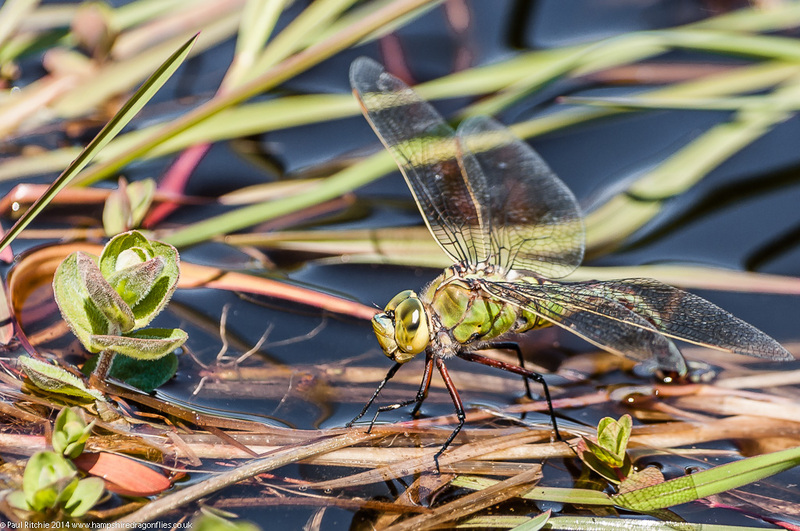 Surprisingly no sign of any Black-tailed Skimmers. 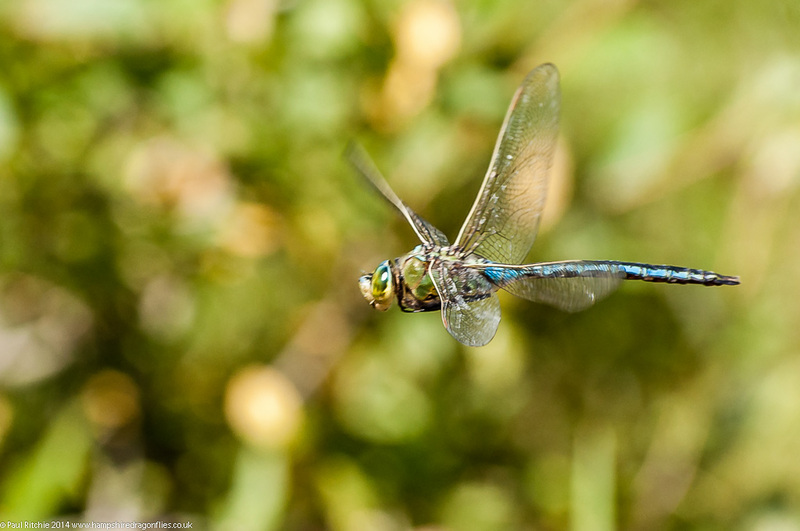 Disappointed by the lack of terrestrial numbers I watched a male Emperor is it gracefully flew in loops, occasionally seeing off a rival male or retreating from the aggressive attention of the Four-spot which was holding territory. I rounded off the afternoon with a quick call into Troublefield to discover there were a few cattle-sized flattened sections, although no sign of any cattle. I can only assume someone had tripped and fallen several times, or broke off for a lie down. Unless of course they were Reed Surfing? A promising, if windy, day prompted me to scout a new location; one I’ve been meaning to visit for a while. 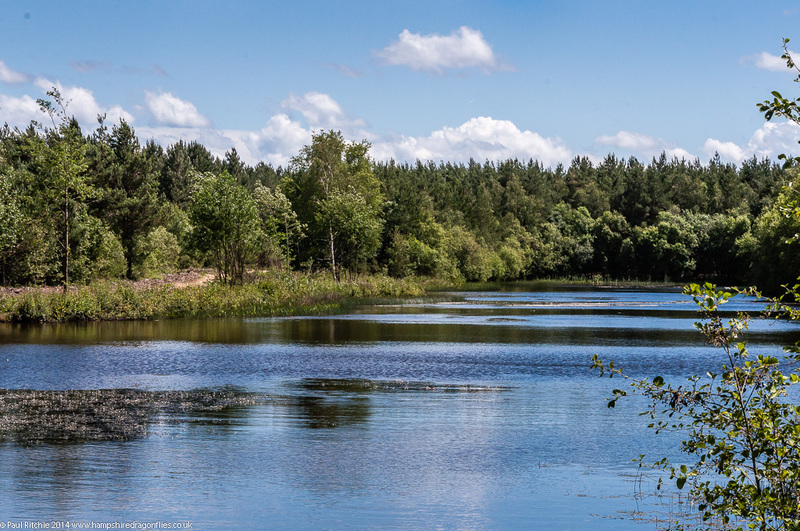 Bramshill Plantation is part of the extensive Eversley Forest complex in North Hampshire, which includes Warren Heath, and contains several ponds and lakes worth investigating. Thankfully there is a suitable parking place enabling close access to the larger lakes in the NE corner, however two of these lakes are set below the surrounding ground level bordered by trees and involve some effort to gain access. I scoured the perimeter of one of these lakes looking for ways through to the shoreline, finding only a few small sections on the western side. 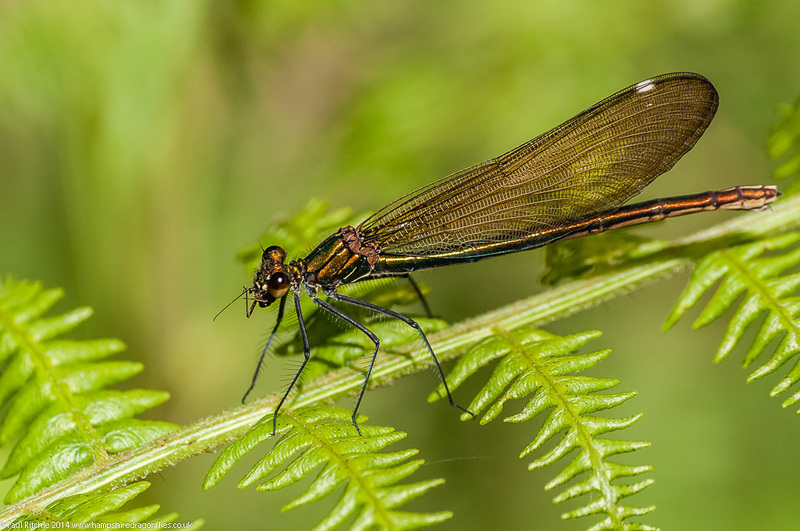 The other lake appeared to offer more options, but I neglected further exploration on this visit in favour of the lake to the south; the short walk in punctuated by decent numbers of Beautiful Demoiselles. This looked far more promising; wooded and concealed to the south-east and open to the north-west with good perimeter paths offering sunny clearings for feeding. 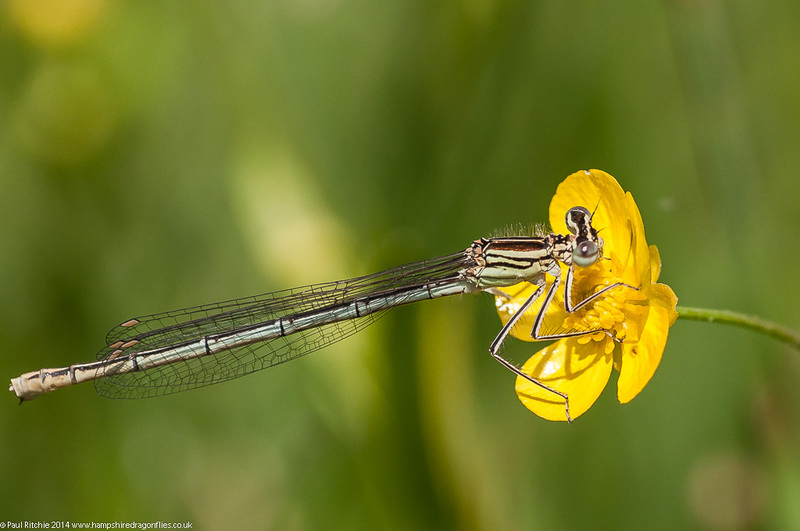 There is also a large open area in the north-west corner with perfect scrubby verges ripe with feeder insects. 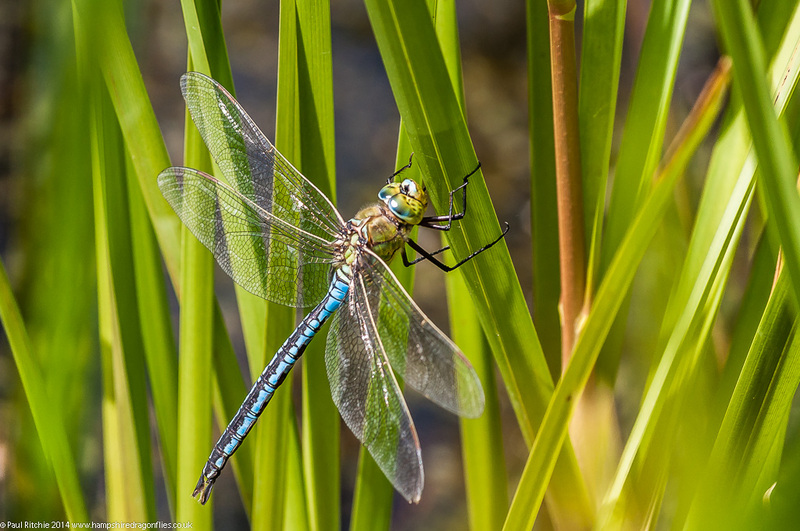 On the open section of the lake activity was minimal in the breeze with only a few Four-spotted Chasers braving open water with the hardy Common Blue. 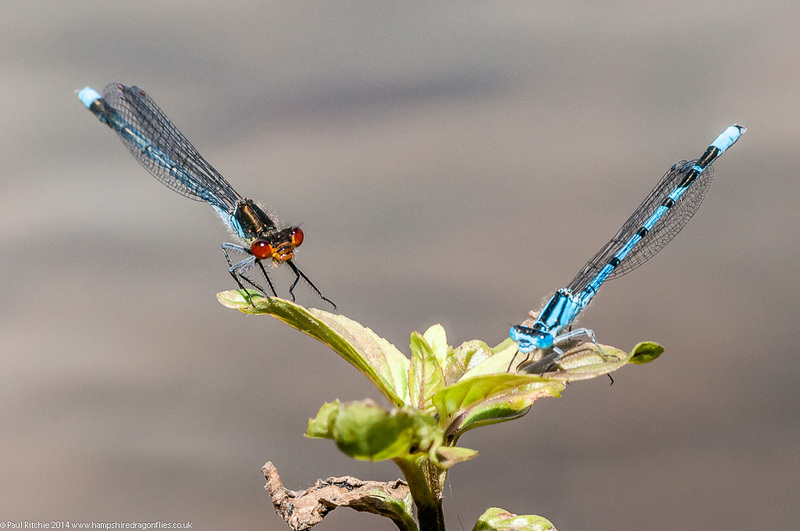 Around the margins were Large Red, Azure, Blue-tailed and Red-eyed waiting for the sun to break through before they ventured out. 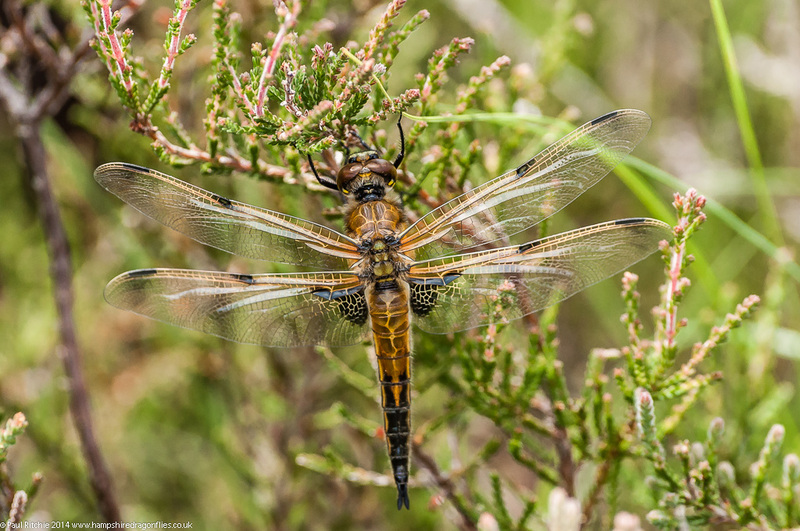 The small open clearings bordering the northern path played host to many more with Four-spotted Chasers, Black-tailed and Keeled Skimmers resting while a couple of male Emperors hawked for food. Had it not been for the wind I would probably have stayed put for a few hours, but vowing to return soon I headed for where I knew there would be more shelter. I immediately headed for the shelter of the reservoirs, hoping there would at least be a little over-water action. Once again it was down to a few hardy species. the waters not yet warmed sufficiently due to being at odds with the now-present sun, leaving the majority in shade. 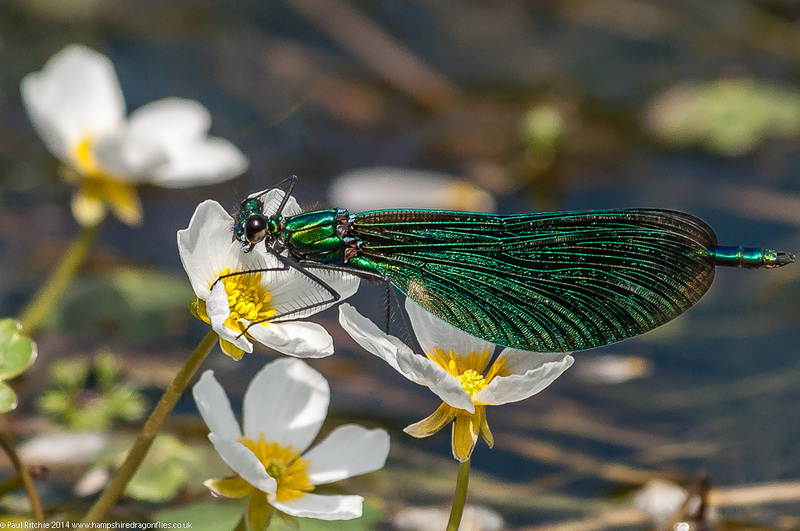 Along the course of the stream there were good showing of Demoiselles and resting or feeding Keeled, Black-tailed and more Four-spots. 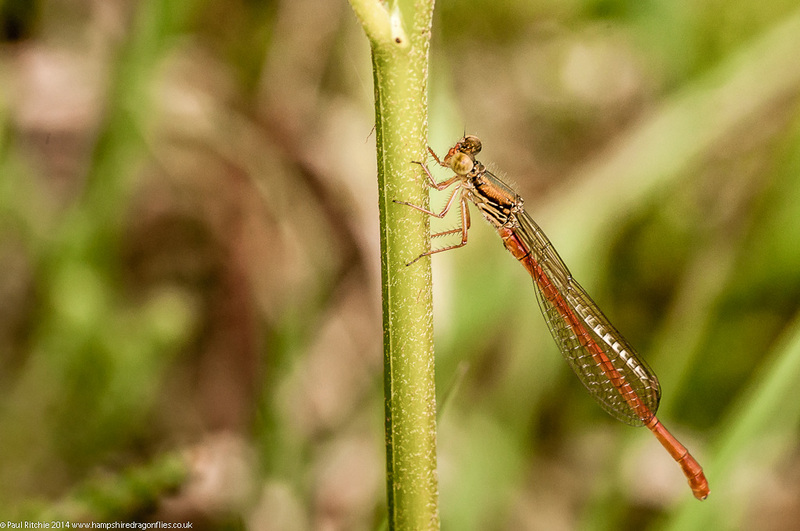 I couldn’t resist a trek through deep mud upwards to the head of the valley, hoping that maybe some Emerald Damselflies and Small Red were on the wing, but if they were they were probably huddled down within the foot-wrenching scrub of the valley floor. 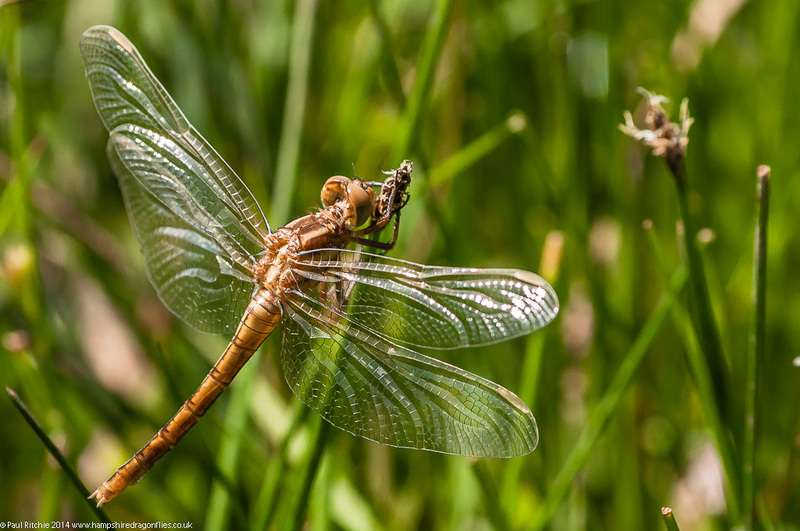 Plenty of Keeled Skimmers along the margins though. 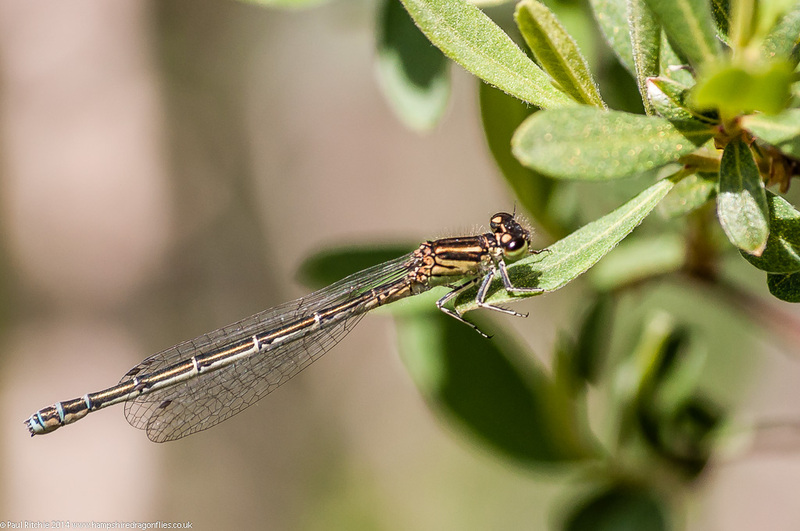 After a circuit of the forest rides I returned to the reservoirs where by now there was enough sun exposure to bring out a few male Downy, while back along the stream my passing disturbed a resting immature female Emperor, causing her to circle above a few times before returning to ground a few metres away. It’s still a tad to early for Warren Heath to come alive, but despite the relatively low numbers there was still a good selection of species to give good sport, and a chance to scout some new terrain this early will offer more time for enjoyment on later visits. 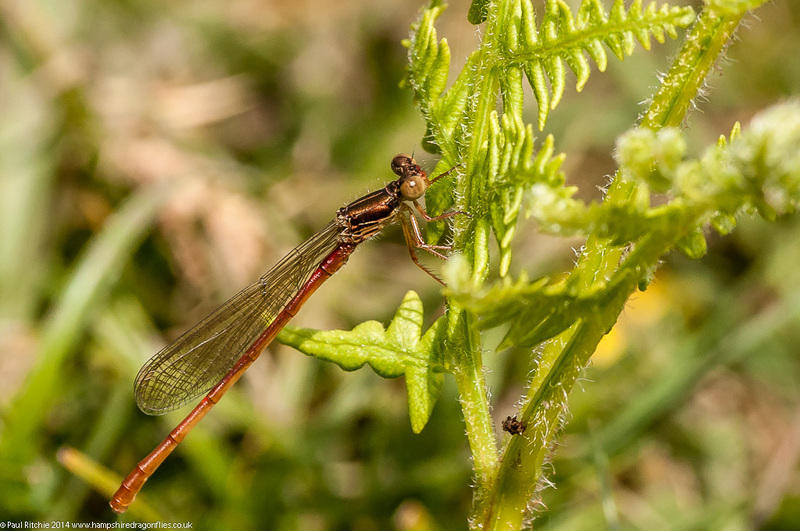 There has to be a masochistic trait somewhere in me to attempt to find, let alone photograph, odonata on a day like today (Tuesday 3rd June). Perhaps it’s there to balance out the sadist? Of course it could simply be boredom. I read somewhere that this is week 23, which I must admit is something I’d rather not think about. Why quantify everything when you should just sit back, relax and enjoy the summer? We’ve waited long enough for it so why wish it away? I guess it did touch a nerve though…and seeing this week’s weather forecast prompted me to grab any sunshine I could. Despite the forecast showing heavy showers, there was at least a hope of a sunny spell or two during the afternoon. When I arrived at the shore the wind was gusting at well over the stated 15mph ‘average’. The only people taking advantage were a couple flying kites! 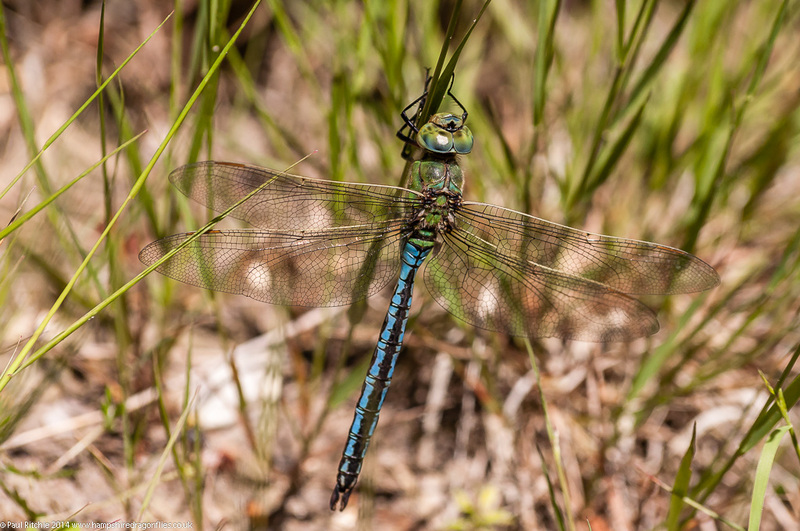 This put the dampers on hoping to find any resting or hawking Emperors along the paths. Still, it was a south-westerly, right? It will be sheltered at the pond. My eyes were immediately drawn to the recent ‘shave’ of a (unnecessarily wide) pathway around the pond. 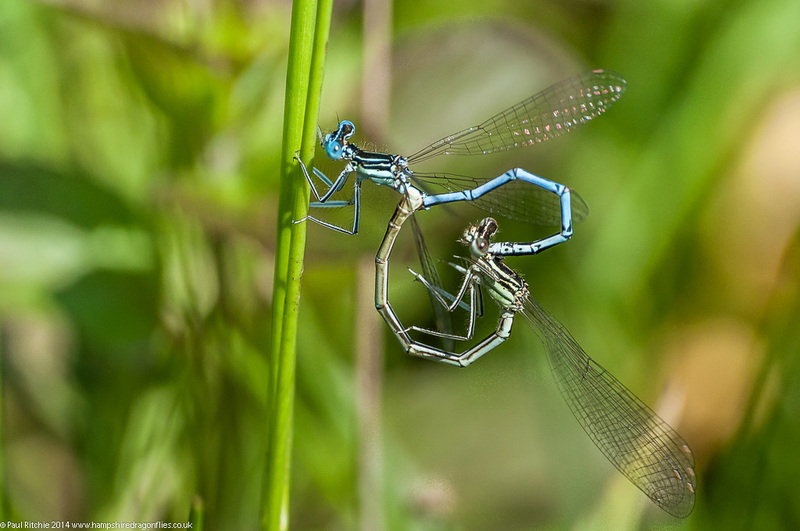 I wonder how many damsels perished? Quite a few I should imagine, as the remaining foliage was rather sparse of life. 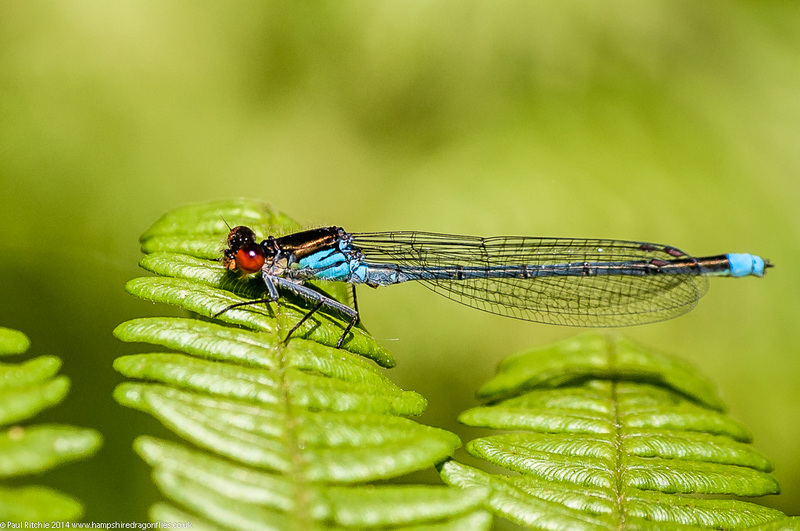 There were just enough Azure, Blue-tailed and Large Red to keep me interested, and the occasional glimpse of a male Banded Demoiselles. 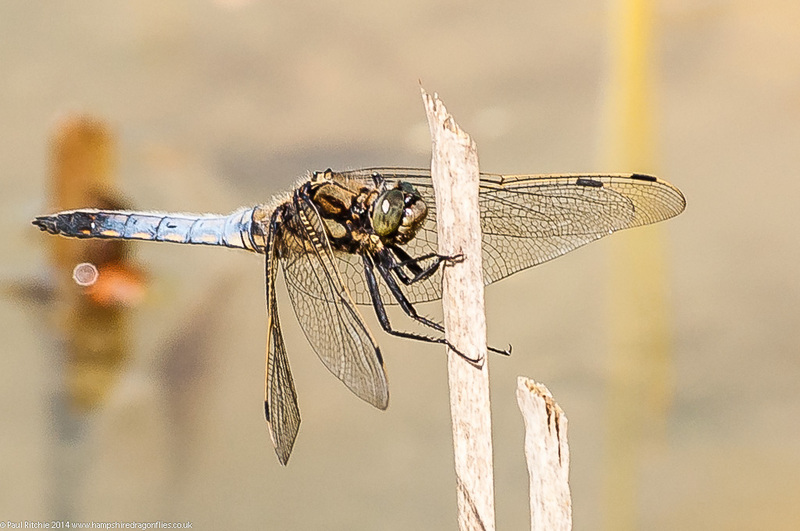 At least two Hairy males began their ceaseless weaving in & out of the reeds once the first sunny spell appeared, but alarmingly not one sign of a Four-spotted Chaser – or a hoped-for male Emperor. Further finger-tip searches through the other side of the path didn’t reveal anything larger either, so I had a coffee before relentlessly circuiting the pond looking for a perfect moment. Too add insult to injury the cuttings from the recent shave had been pushed against the margins, forcing back the natural growth angle and forming untidy holes, the damsels preferring to take to the trees to find a safe perch. Whilst sat on the bench having another coffee I noticed a male Hairy was hawking barely 6 inches above the main track, possibly in search of a perched female rather than seeking out lunch. He flew back and forth at this height for a good three minutes before disappearing around the corner. Back at the other side I noticed he, or another, was doing exactly the same along the shaven scar, and took rest right in front of my eyes. I really must scan slowly ahead when I’m walking the path, as perched right in front of me was a female Hairy, who flew off before I had a chance to raise the camera. I wonder if the male(s) had caught the scent of her presence? 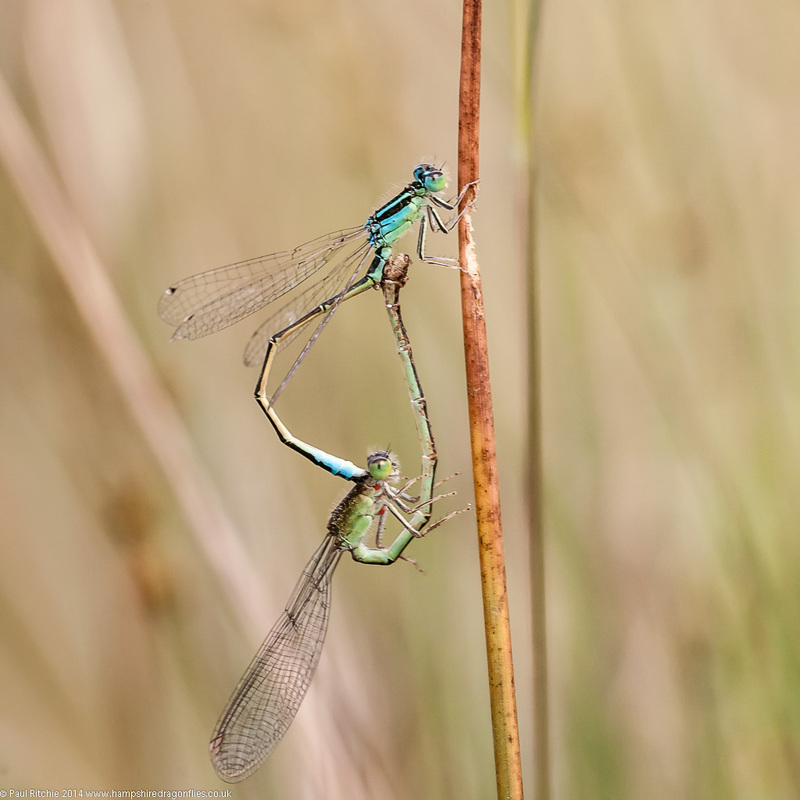 After this (clumsy) disappointment I continued peering through the green hoping one of the colourful female Blue-tailed would offer an unobstructed view. Despite the low numbers all immature colour forms were present, but by now the sun had left and the only one offering a worthy angle was this beautiful violacea. Slim pickings but plenty to keep me occupied to the extent that one of the wardens appeared reminding me they close at 5.00pm!